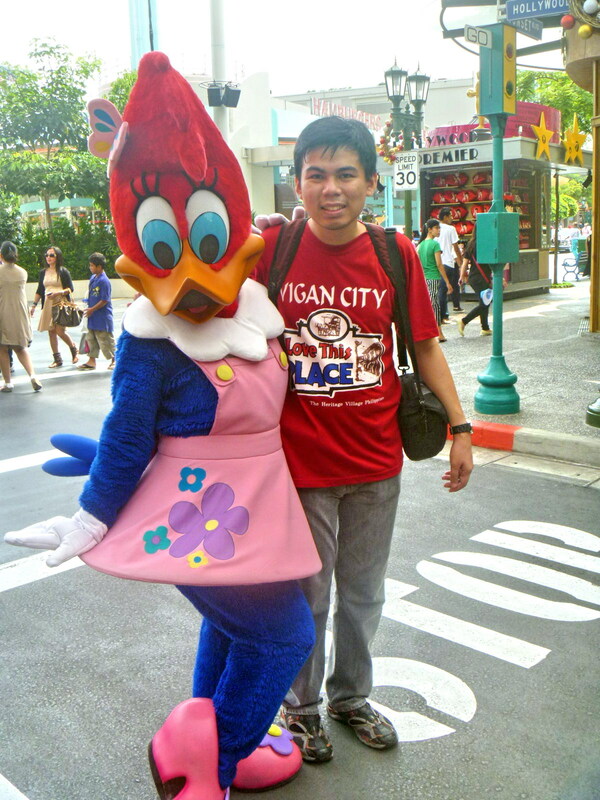 The next day was to be my niece Jaja’s wedding day but, since it was to be held in the late afternoon, Jandy and I still had the whole morning for sightseeing. 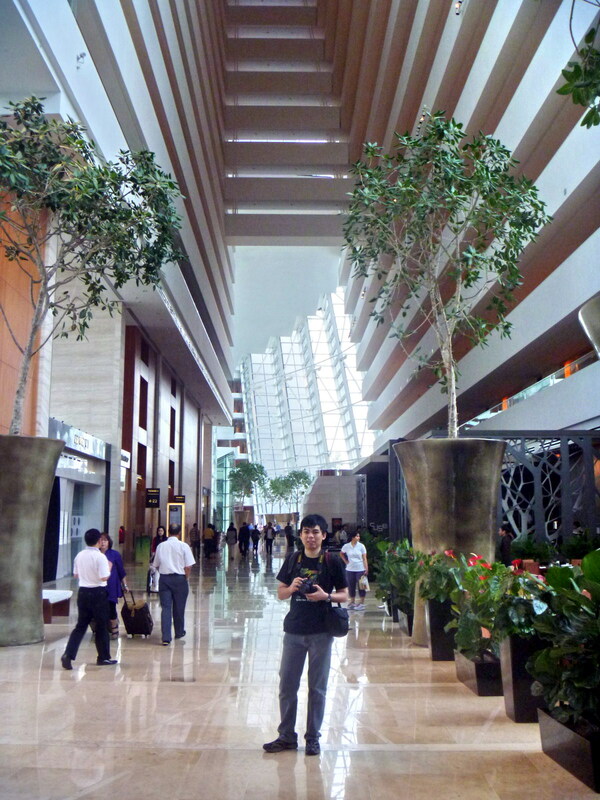 After breakfast at our hotel, we took a taxi to the 20-hectare Marina Bay Sands, an integrated resort fronting Marina Bay officially opened last June 23, 2010, after a partial opening (which included the casino) on April 27. Designed by Moshe Safdien Architects (with Aedas Singapore as the local architect of record), its engineering was provided by Arup and Parsons Brinkerhoff (which had originally worked on such prestigious projects such as the Beijing National Aquatics Center and the Sydney Opera House) and the main contractor was Ssanyong Engineering and Construction. 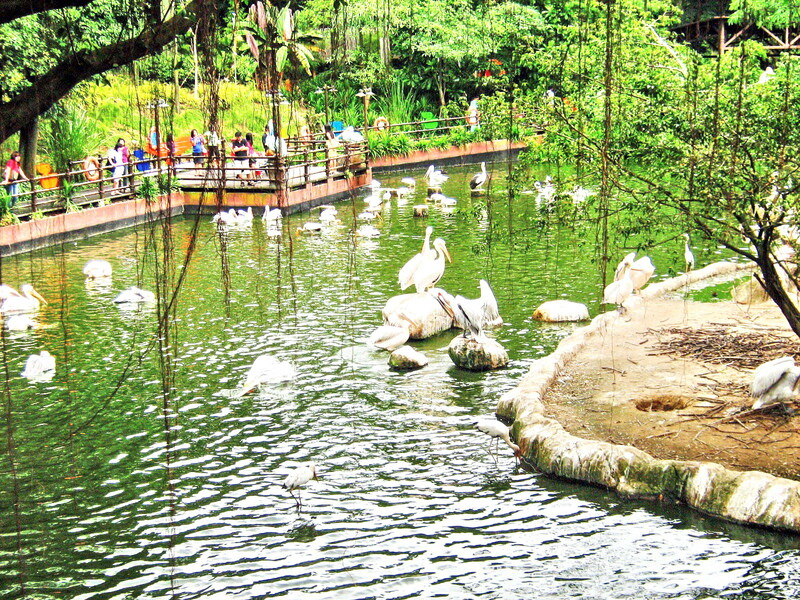 The resort’s architecture as well as major design changes along the way were also approved by the late Master Chong Swan Lek and Master Louisa Ong-Lee, its feng shui consultants. Developed by Las Vegas Sands, this S$8 billion (including cost of the prime land) casino is billed as most expensive stand-alone atrium casino in the world, with 500 tables and 1,600 slot machines. However, we were not visiting for the gambling. 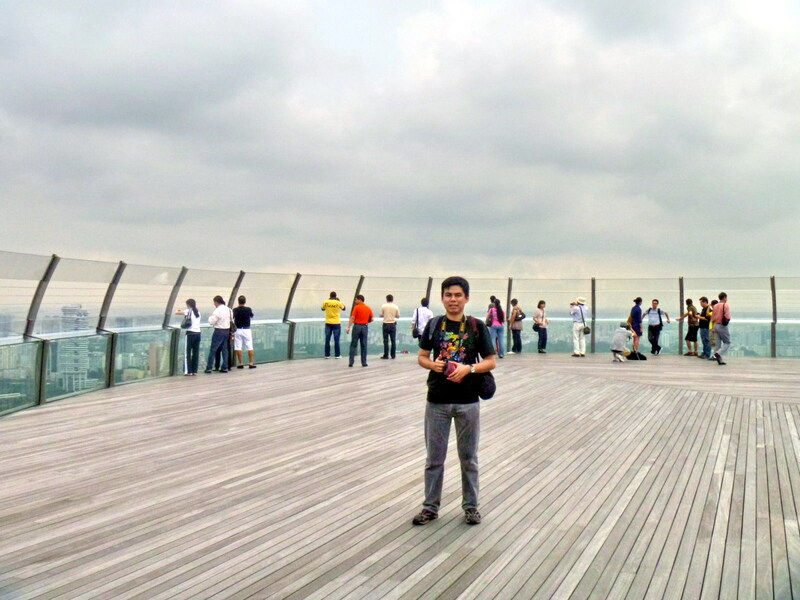 Rather, we were there for the 360-degree Singapore skyline view atop its 340m-long (stretching longer than the Eiffel tower laid down or four and a half A380 Jumbo Jets), 1-hectare and 3,900-pax SkyPark, a sky terrace which connects the three 55-story hotel towers and is set on top of the world’s largest, gravity-defying public cantilevered platform, overhanging the north tower by 67 m..
Aside from housing the world’s largest casino, the resort features a 2,561-room hotel, a 1,300,000-sq. ft. (120,000 m2) convention-exhibition center, the 800,000 sq. ft. (74,000 m2) The Shoppes at Marina Bay Sands mall (with over 300 stores and F&B outlets), the 200,000 sq. 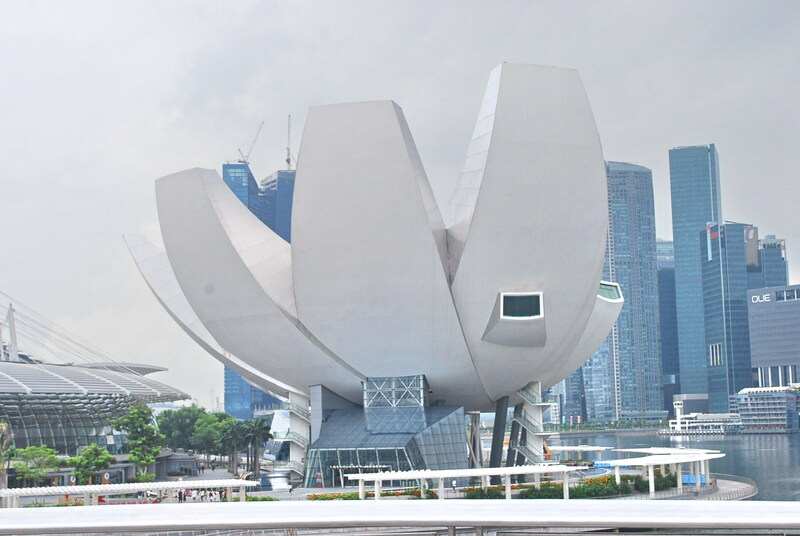 ft. (19,000 m2), lotus-shaped ArtScience Museum located next to the three blocks (currently featuring “Titanic: The Artifact Exhibition”), two large theaters (the 1,680-pax Sands Theater and the 2,155-pax Grand Theater), two floating Crystal Pavilions (the 2nd houses the world’s largest Louis Vuitton boutique) and a 6,500 sq. ft. (600 m2) indoor ice skating rink (which uses artificial ice). 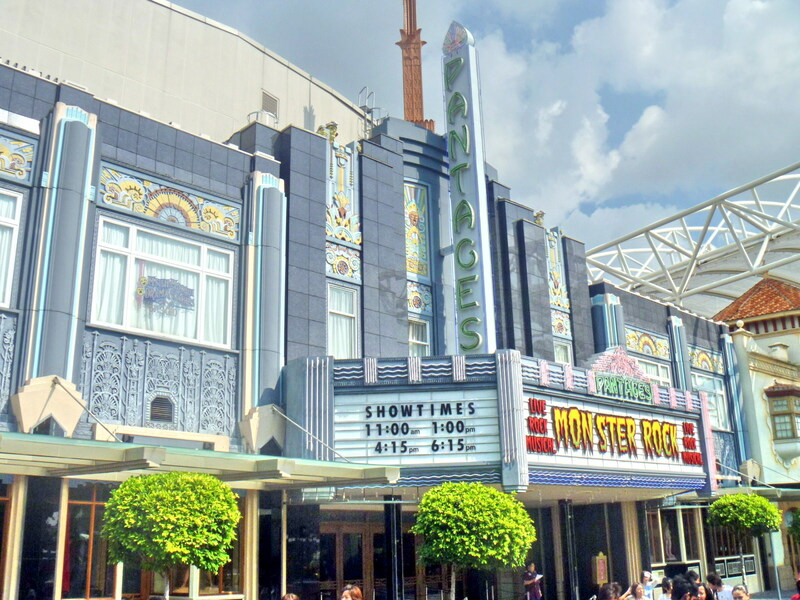 There are also 7 “celebrity chef” restaurants (6 within the Shoppes) – Cut, Waku Ghin, Pizzeria and Osteria Mozza, Guy Savoy, DB Bistro Moderne, Santi and Rasapura Masters. 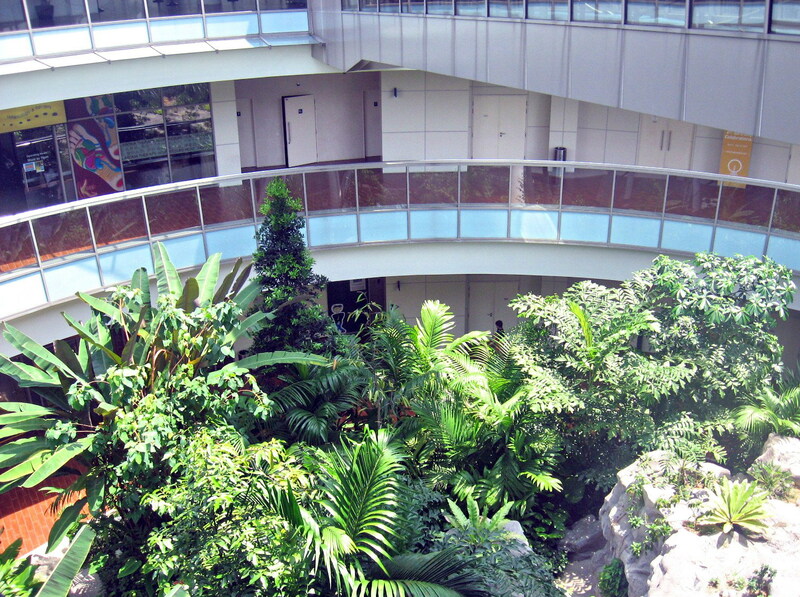 Upon arrival, we entered the hotel’s huge atrium lobby, decorated with tall Christmas trees, and walked some distance to the SkyPark Box Office located at the Basement 1, Tower 3. 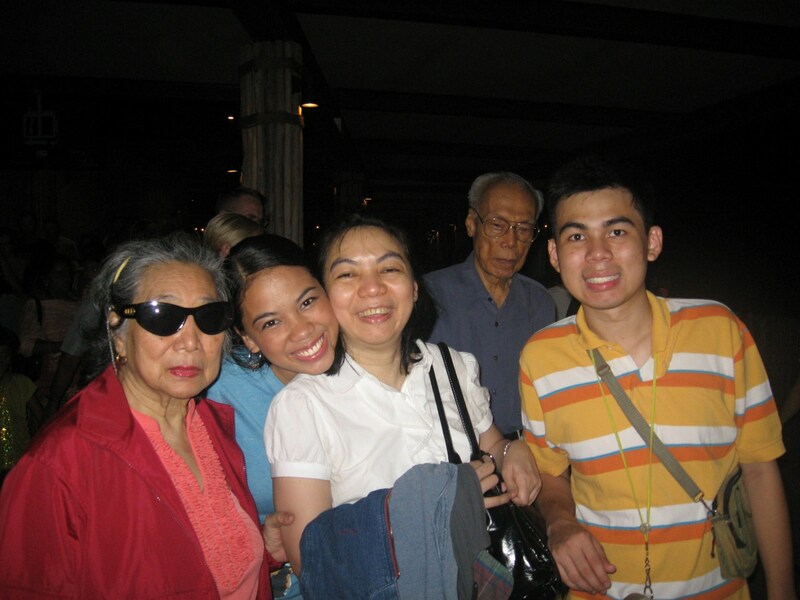 After purchasing our entry tickets here, we proceeded to the porte cochere area outside the Tower 3 and took the elevator to 57th floor where the SkyPark is located. The SkyPark is also home to the world’s longest elevated outdoor swimming pool, perched 191 m. above ground and with a 146-m. (478-ft) vanishing edge. However, we missed out to view the pool (as well as its lush gardens and rooftop The Sky on 57 restaurant) as it is available only to 50 observation deck guests that have registered for the 15-min. 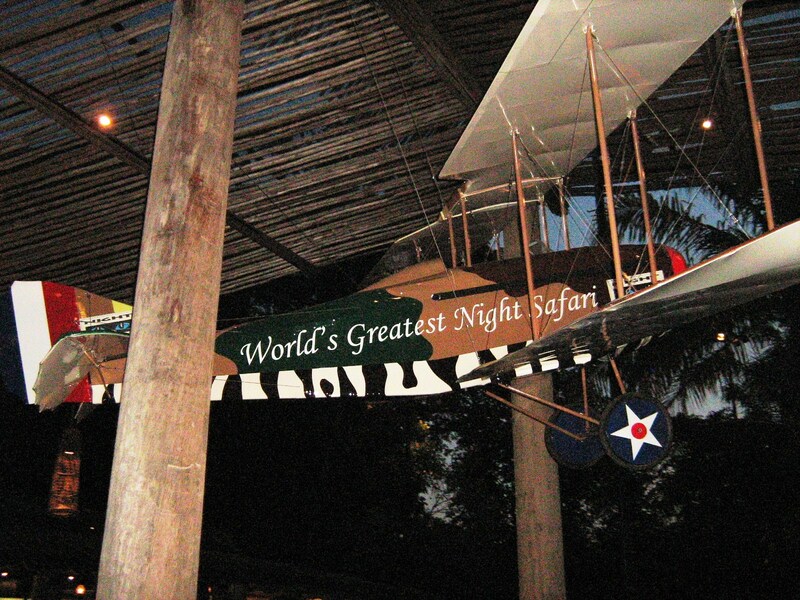 guided tours (available at 10 AM, 2 PM and 9 PM only). The pools were made with up to 422,000 pounds of stainless steel and can hold 376,500 gallons (1,424 cu. m.) of water. 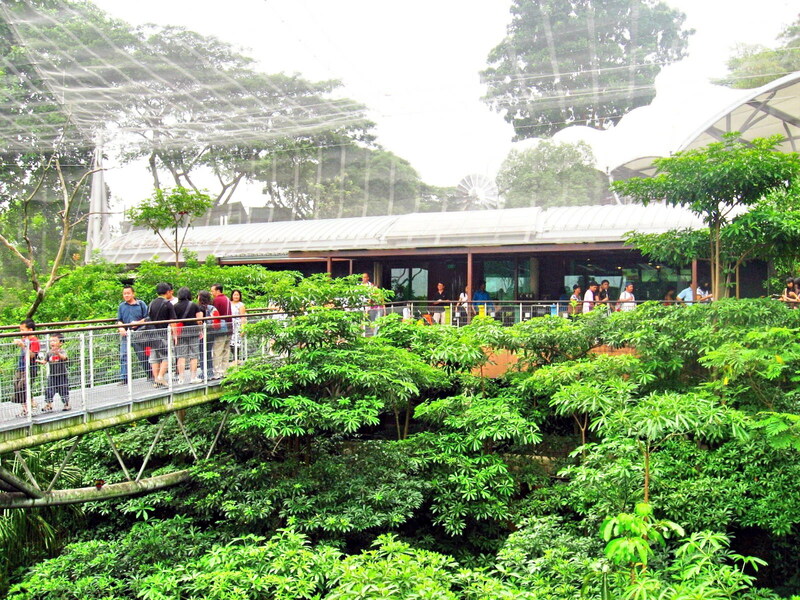 Within the observation deck is the KU DÉ TA nightclub. The day, though slightly overcast, still afforded us a spectacular, unforgettable panoramic view, from 10 observation deck view points, of Singapore’s Central Business District, the Merlion, Old Supreme Court Bldg., New Supreme Court Bldg., City Hall Bldg., Esplanade, St. Andrews Cathedral, Float @ Marina Bay, Helix Bridge, the Singapore River, the Formula One pit building and racetrack, the Padand (Singapore Recreational Club and Cricket Club), Marina Barrage, East Coast Parkway, Benjamin Sheares Bridge, Changi Airport control tower, the Singapore Flyer (an observation wheel), Nicoll Highway, Little India, Sentosa Island, Singapore Port and, beyond, Kusu Island and Indonesia’s Batam Island. 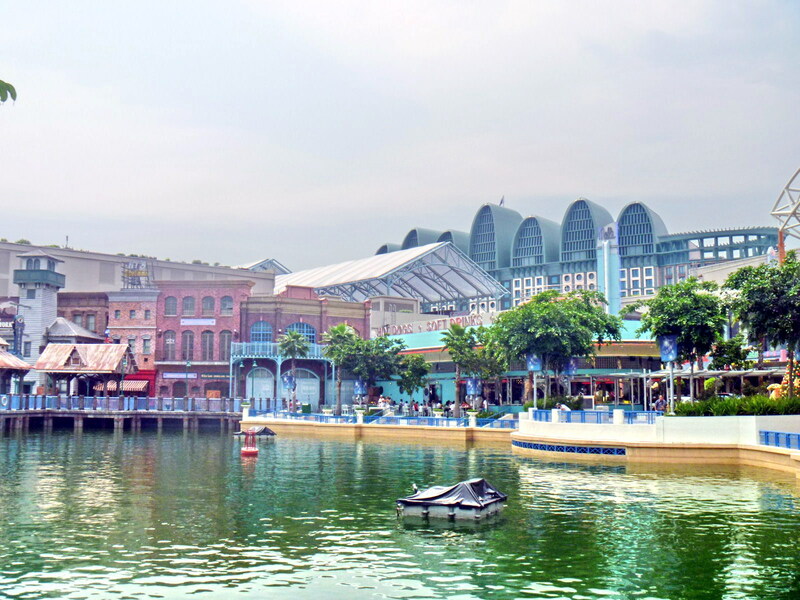 Just below are the resort’s theaters, the Event Plaza, the Crystal Pavilions, the Sands Expo and Convention Center, the ArtScience Museum, the Marina Bay Sands casino and The Shoppes at Marina Bay Sands. 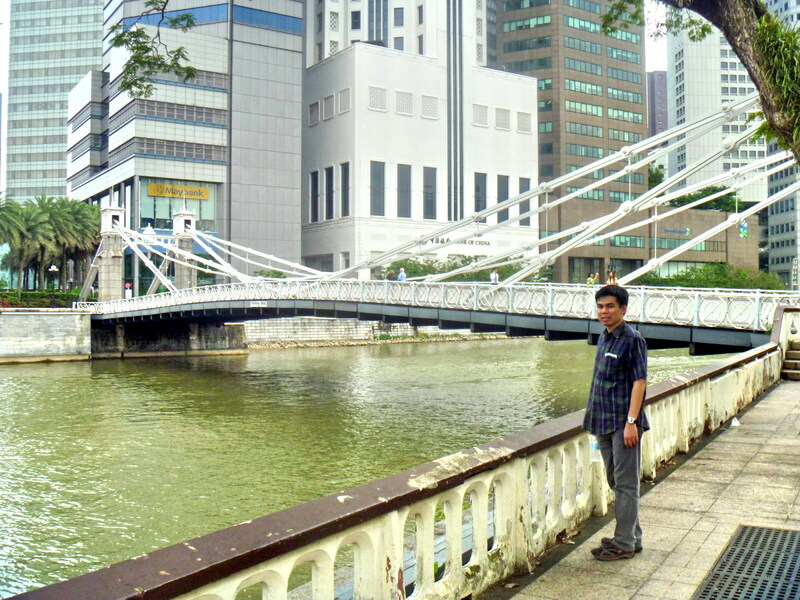 Upon reaching the end of South Bridge Rd., Jandy and I were now at the banks of the historic 6-km. long (19,690-ft.) long Singapore River. 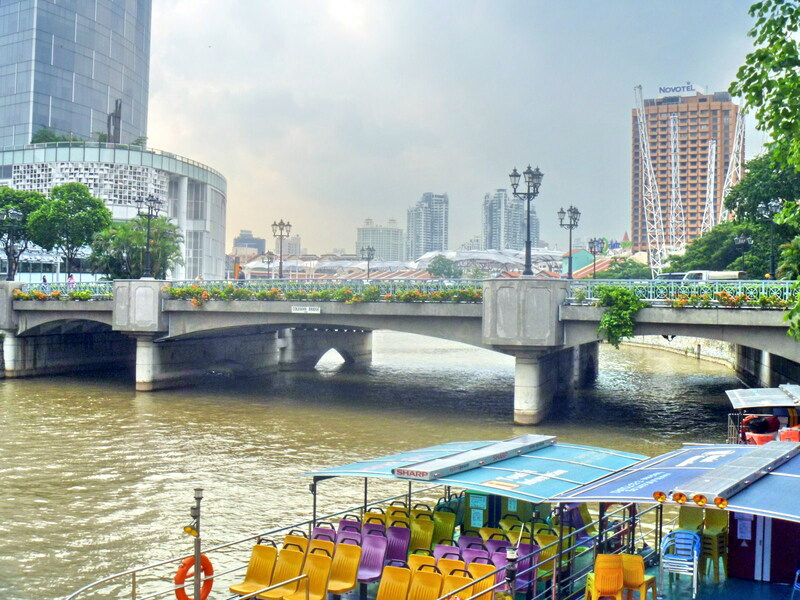 Here, we viewed a number of pedestrian and vehicular bridges that span this river, serving the needs of Singaporeans and visitors alike by connecting residential, commercial and entertainment areas. They also add history (rickshaws, ox carts, cattle, horses, etc. 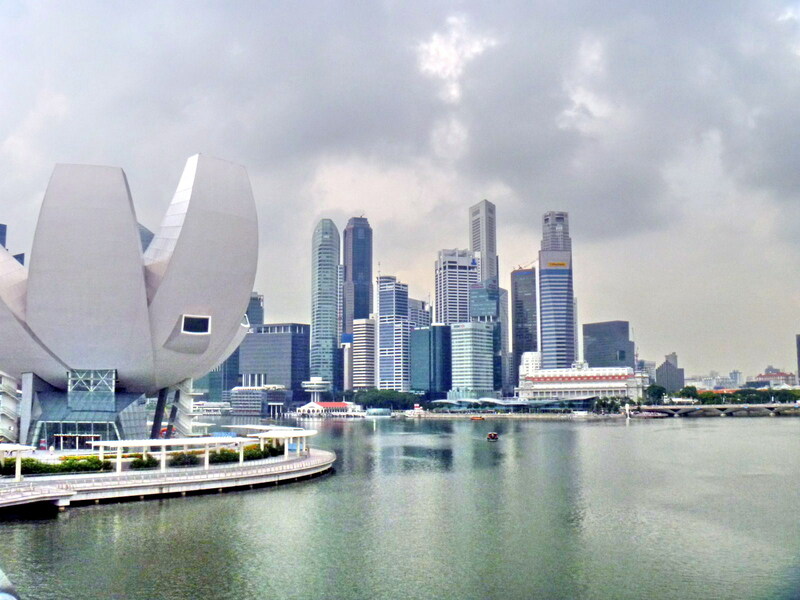 used to pass here), high technology and color to the Singapore skyline. Three of these bridges – Anderson Bridge, Cavenagh Bridge and Elgin Bridge – were, on November 3, 2008, selected for conservation as part of the Urban Redevelopment Authority’s expanded conservation program. 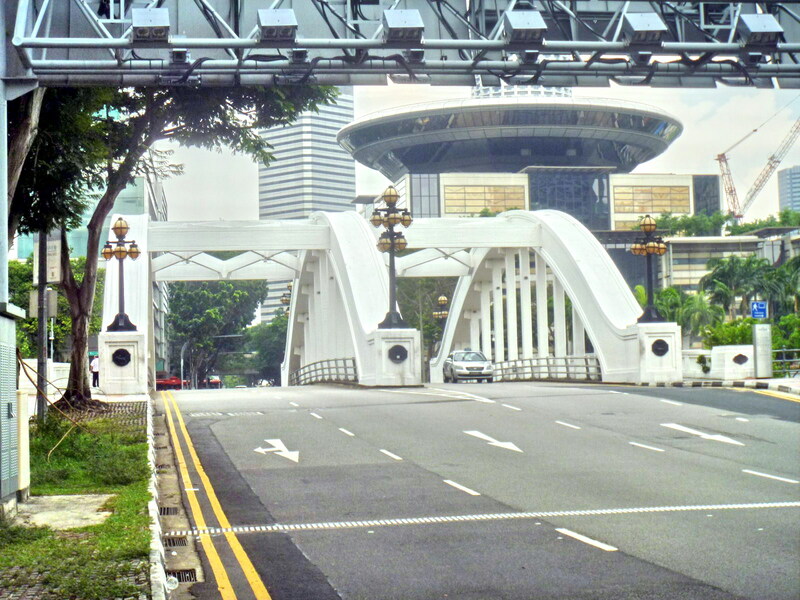 The Anderson Bridge and the newer Esplanade Bridge also forms part of the Singapore Grand Prix‘s Marina Bay street circuit which debuted on September 28, 2008. The Cavenagh Bridge, opened in 1870 (the third bridge to be built in Singapore) to ease access between the civic district on the north bank and the commercial district (now Raffles Place) on the south bank , is the oldest among the original bridges spanning the Singapore River. 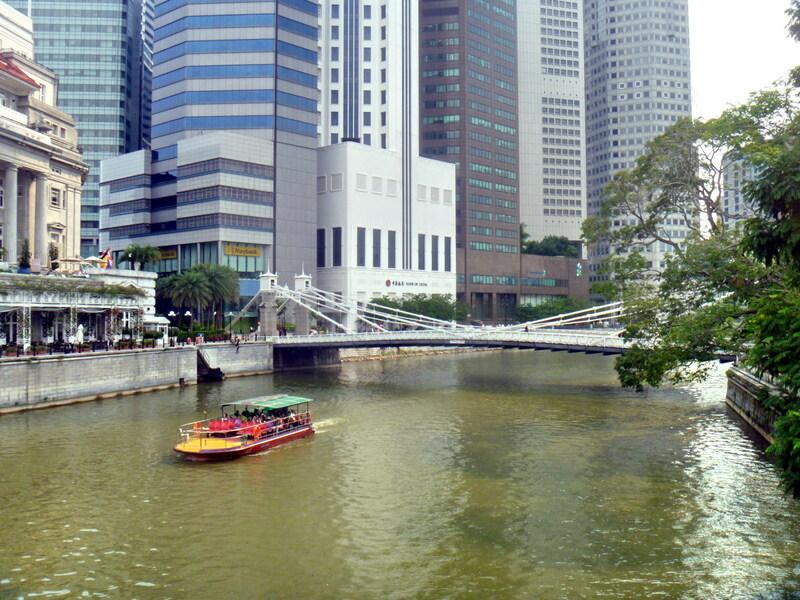 It spanned the lower reaches of the Singapore River in the Downtown Core. Before this bridge was built, people could only get to the 2 districts via a detour over Elgin Bridge or by paying 1 duit (¼ cent) for a boat ride across the river. Originally known as the Edinburgh Bridge (to commemorate the visit of the Duke of Edinburgh), it was renamed in honor of Maj.-Gen. William Orfeur Cavenagh, the last India-appointed Governor of the Straits Settlements (1859-1867). His family’s coat-of-arm scan still be seen atop the sign at both ends of the bridge. Cavenagh Bridge, originally designed as a drawbridge, is also Singapore’s first and only steel suspension bridge, with elaborate suspension struts. During construction, numerous steel rivets were used and steel casting methods commonly used during that era were employed. Its parts were manufactured by P & W MacLellan, Glasgow Engineers (Scotland ) at a cost of S$80,000, built and tested in Glasgow to withstand a load 4 times its own weight, shipped to Singapore in parts and it reassembled by Indian convict labor. 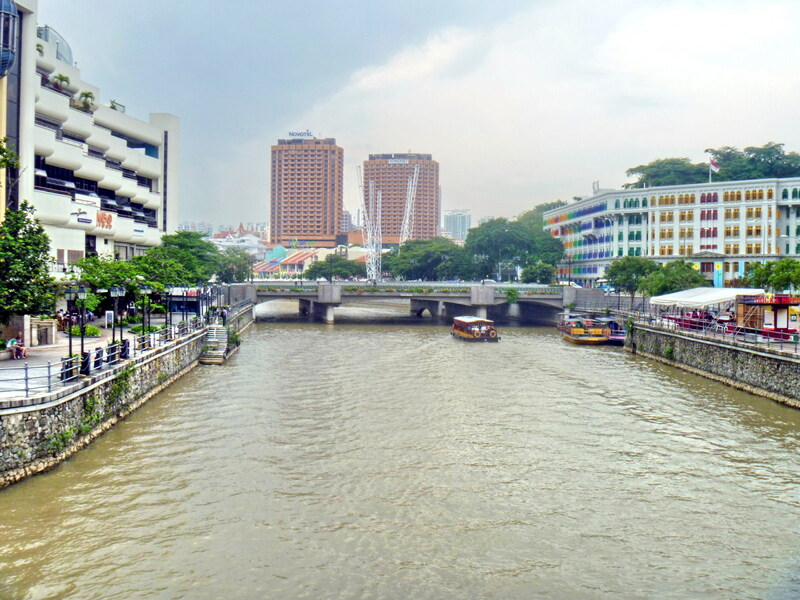 Subsequently, in the late 1880s, the bridge became overloaded due to the flourishing trade on the Singapore River and vehicular traffic volume overtook the capacity of the bridge. Added to this was its low draught which was insufficient for the passage of boats during high tide. The bridge was eventually spared from demolition by conversion to a pedestrian bridge. 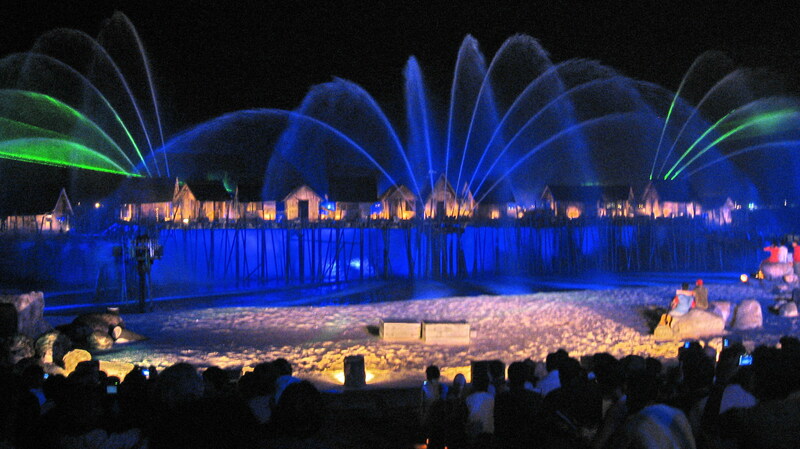 In the 1990s, lighting was added to accentuate its architectural features at nightfall. It now complements the renovated Fullerton Hotel (formerly the Fullerton Building) beside the bridge. 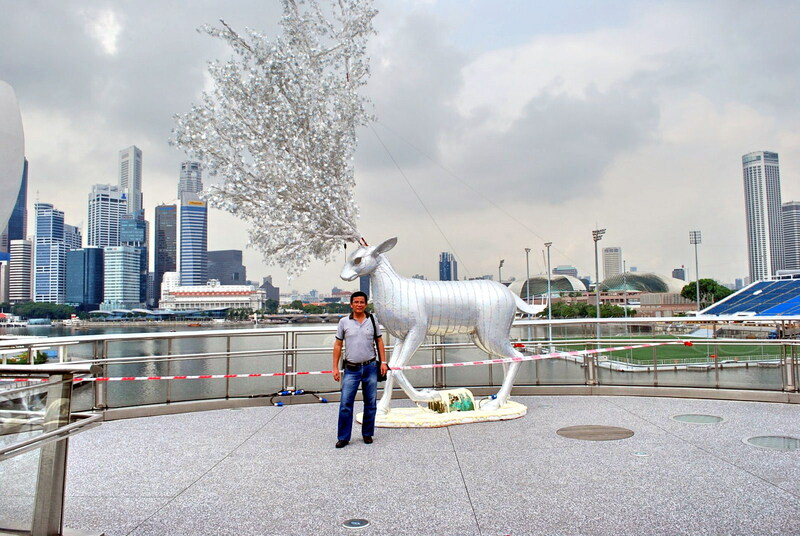 At the southwest abutment of the bridge are sculptures of a family of Singapura cats (kucinta or drain cats), recognized as one of the smallest breeds of cats in the world. At both ends of the bridge are preserved police notices restricting the passage of vehicles that weighed beyond 3 CWT (152 kgs. or 336 lbs. ), including cattle and horses. Cavenaugh Bridge’s replacement was the century-old Anderson Bridge, near the river’s mouth, which provided sufficient clearance for vessels to pass under during high tide. 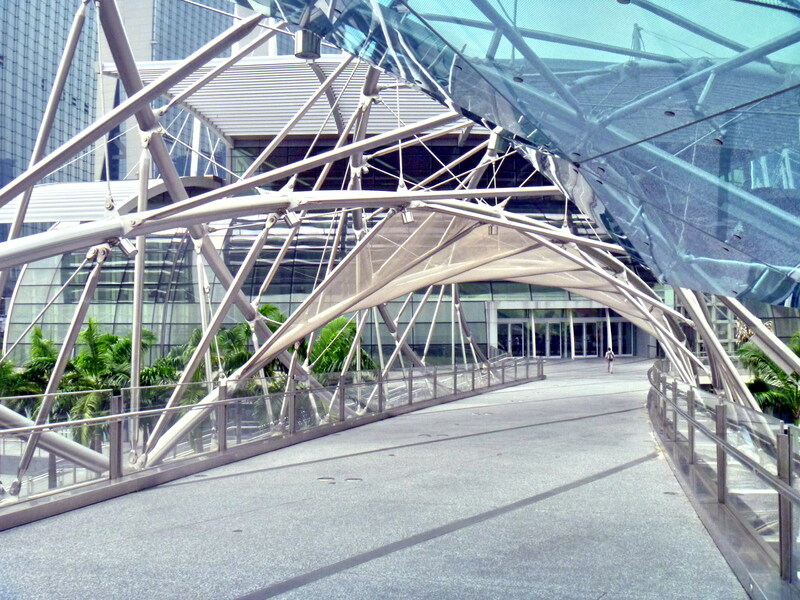 Connecting the financial district directly to City Hall, this bridge is also located near the Fullerton Hotel and the former Merlion Park. An excellent combination of intricate plaster and metalwork, this elegant bridge has 3 steel arches with supporting steel ribs across them, 2 rusticated archways and a fluted pier on each end. The abutments were built by the Westminster Construction Company Limited. Started in 1908, it was officially opened on March 12, 1910 by Sir John Anderson (Governor of the Straits Settlements and High Commissioner for the Federated Malay States from 1904–1911) after whom the bridge was named. During the 1942-1945 Japanese Occupation, the severed heads of criminals were hung on the bridge as a warning to discourage citizens from breaking the law. The slightly younger, concrete Elgin Bridge, a vehicular bridge in the Boat Quay area linking the Downtown Core to the Singapore Planning Area located within Singapore’s Central Area, was named after India governor-general (March 21, 1862-November 20, 1863) Lord James Bruce, the 8th Earl of Elgin. Elgin Bridge is believed to have existed, as early as 1819, at its current location as an unnamed footbridge linking the Chinese community, on the southern side, to the Indian merchants of High St. on the northern side. As this was the first bridge across the river, the two roads leading to it were named North Bridge Rd. and South Bridge Rd. accordingly. In 1822, this footbridge was replaced by the Presentment Bridge, a wooden drawbridge (also called the Monkey Bridge, as its narrowness limited the number of people crossing at a time, therefore using it required some agility) was built by Lt. P. Jackson. In 1843, a wooden footbridge, built by John Turnbull Thomson replaced the drawbridge (also called the Thomson Bridge). In 1862, an iron bridge was built but, in 1925, the iron bridge had to make way for the new, existing bridge which was opened to traffic by Sir Hugh Clifford, Governor of the Straits Settlements, on May 30, 1929. The 260 m. (850-ft.) long, 70 m. (230-ft.) wide, low-level concrete arched Esplanade Bridge, a vehicular and pedestrian bridge along Esplanade Drive, in front of the mouth of the Singapore River, was built, from early 1994-1997, to provide faster access between Marina Center and the Shenton Way financial district. After completion, it was found out that the bridge blocked views of the iconic Merlion statue from the Marina Bay waterfront, causing the statue to be transferred from the back to a more prominent place at the front of the bridge. 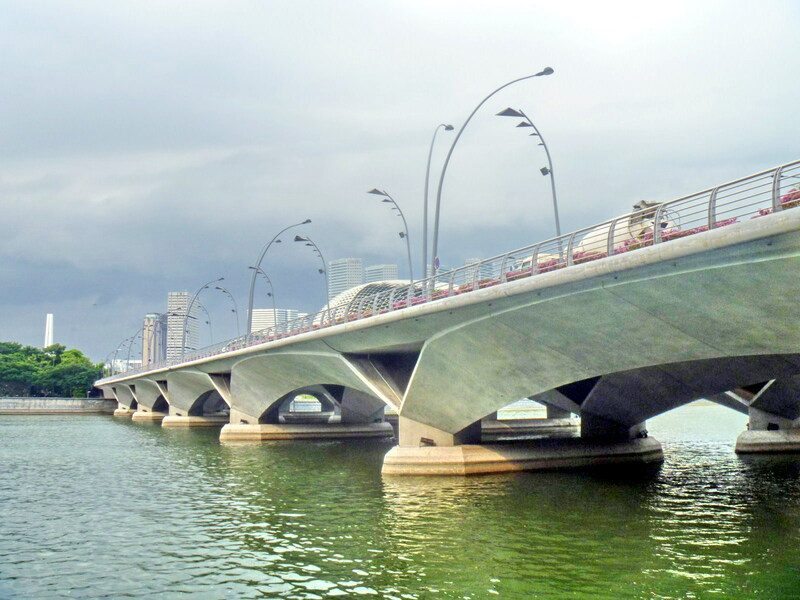 The Esplanade Bridge has 7 spans and supports two 4-lane carriageways and walkways along both sides. 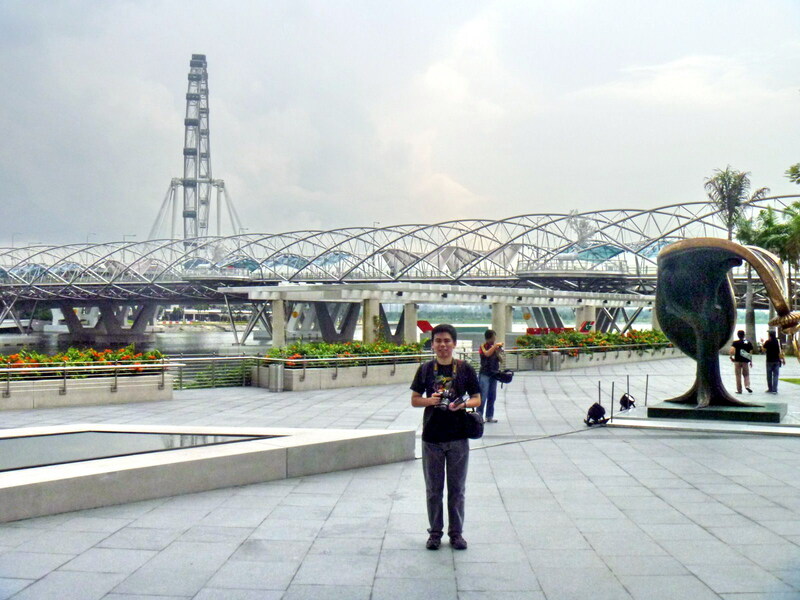 The bridge offers panoramic views of Marina South, the rest of Marina Bay and both sides of the Singapore River. As such, it is often subject to occasional road closures during National Day and New Year’s Eve and the street lamps along it are shut off to allow spectators, pedestrians and revelers who pack all 8 lanes of the bridge a pleasant and unadulterated view of the fireworks. 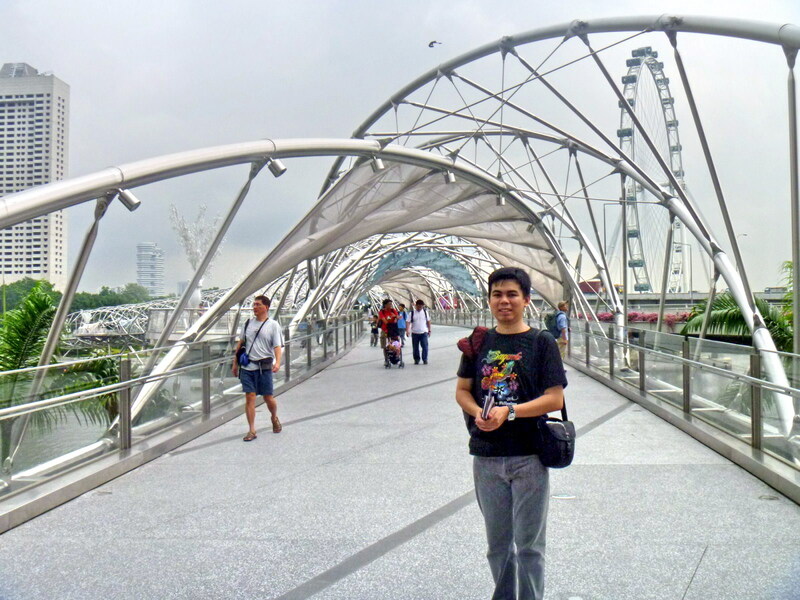 The Helix Bridge, next to Bayfront Ave., was opened on July 18, 2010. Previously known as the Double Helix Bridge, it is the world’s first curved bridge. 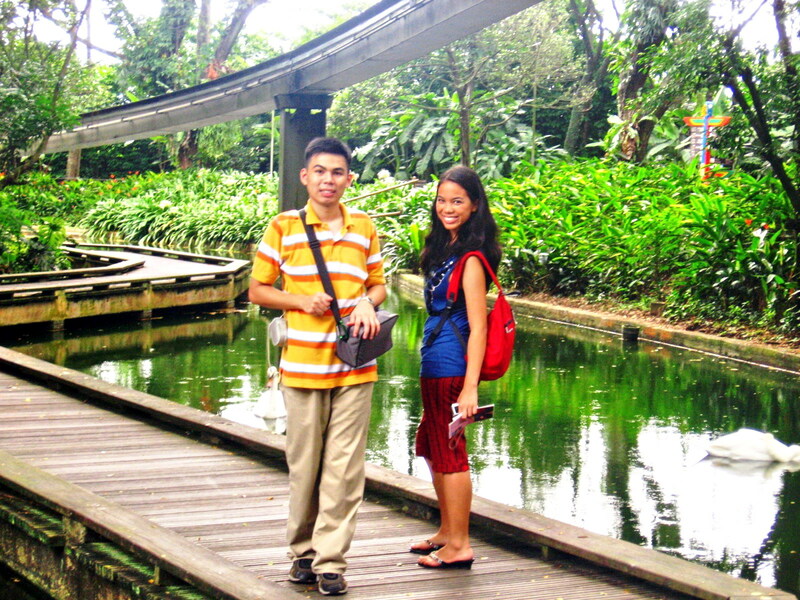 This 280 m. (918-ft.) long pedestrian bridge is (Singapore’s longest) is located beside the Benjamin Sheares Bridge and is accompanied by the Bayfront Bridge, a vehicular bridge. The Helix Bridge links the hotels, commercial buildings and shops of Marina Center with Marina South in the Marina Bay area (a body of water formed through land reclamation at the mouth of the Singapore River). The bridge has 5 strategically located viewing platforms sited at strategic locations. 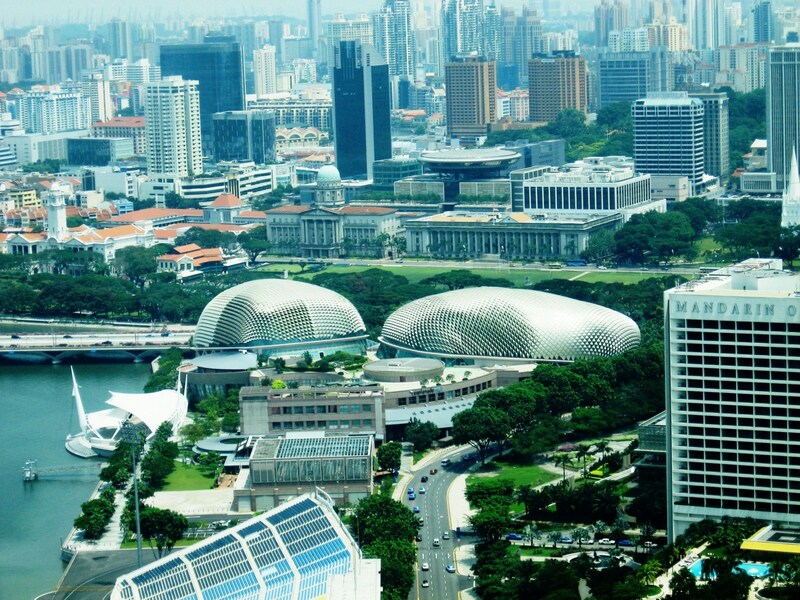 They provide stunning views of the Singapore skyline and events taking place within Marina Bay. 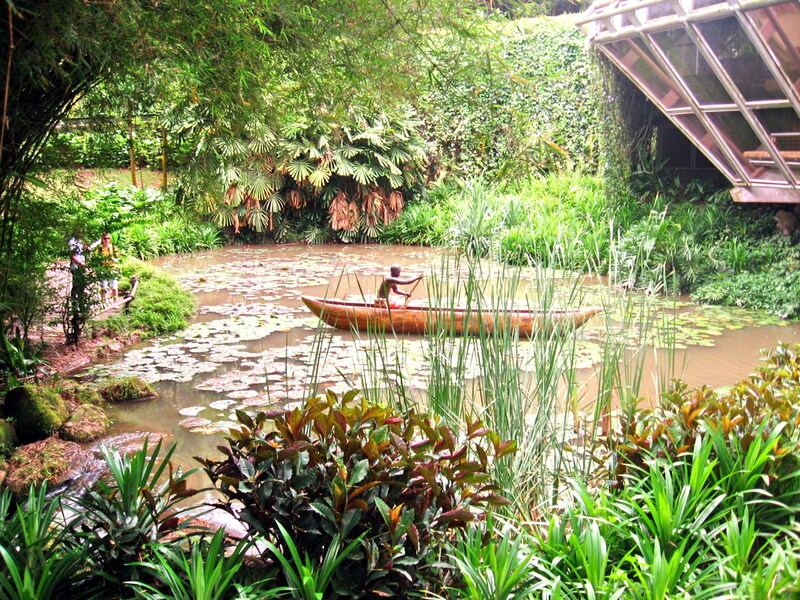 The bridge also functions as a gallery where children’s paintings and drawings are exhibited for public viewing. The bridge is illuminated at night by a series of lights that highlight the double-helix structure, thereby creating a special visual experience for the visitors. Pairs of colored letters “C” (cytosine), “G” (guanine), “A” (adenine) and “T” (thymine), representing the bases of DNA, are lit up in red and green. The Helix Bridge was designed by an international consortium including the Cox Group of Australian architects, Arup engineers, and Singapore’s Architects 61 and was fabricated and erected by TTJ Design and Engineering. The bridge’s design features a series of connecting struts that hold together two spiraling steel members that resembles the structure of DNA (the building blocks of life), symbolizing life and continuity, renewal, abundance and growth, with the aim of attracting happiness and prosperity to Marina Bay. It used approximately 650 tons of duplex stainless steel and 1,000 tons of carbon steel tubes to create the bridge’s major and minor helix that spirals in opposite directions. To provide shade for pedestrians, canopies made of fritted glass and perforated steel mesh were incorporated along parts of the bridge’s inner spiral. 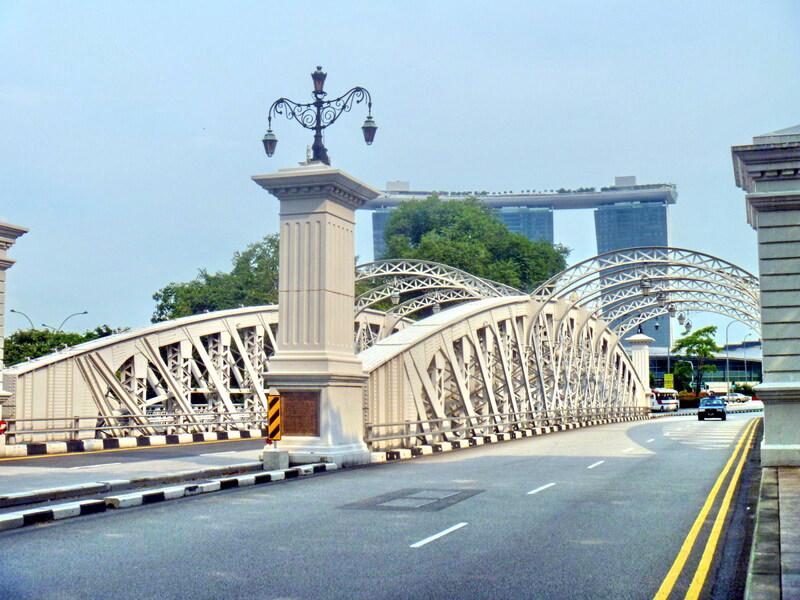 The Coleman Bridge, a vehicular bridge linking Hill St. and New Bridge Rd., near Clarke Quay, was the second bridge built across the Singapore River and the first built in masonry. 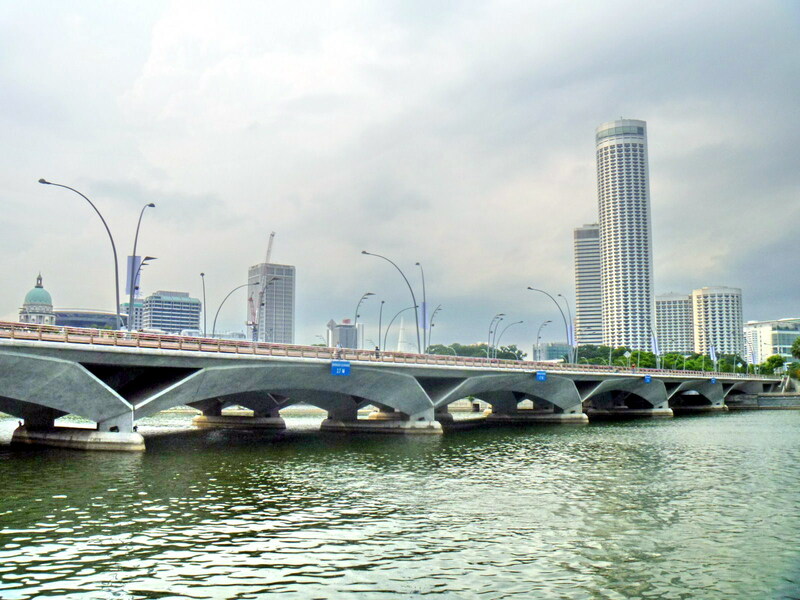 Part of the bridge demarcates a boundary between the Downtown Core and the Singapore River Planning Area, both located within the Central Business District. 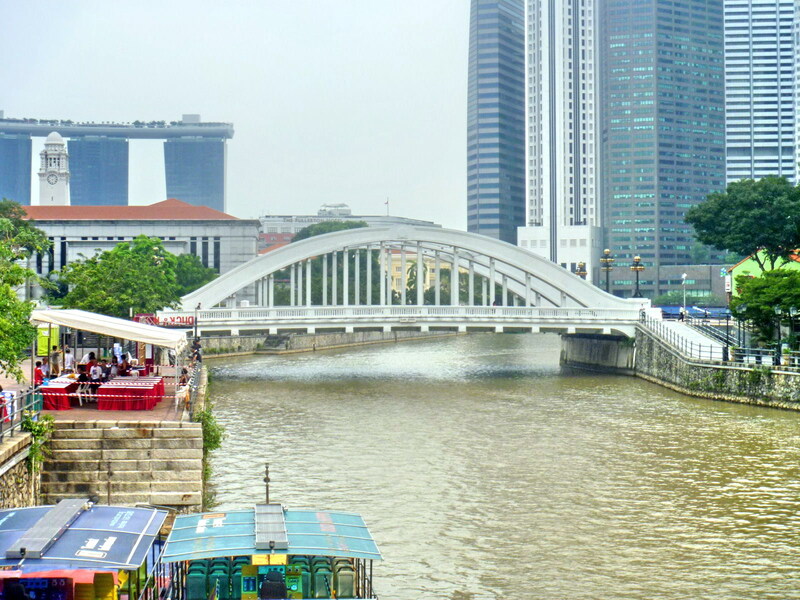 It first started out as a 9-arched brick bridge, built in 1840, designed by and named after Irish architect (Singapore’s first) George Drumgoole Coleman (1795–1844). It was referred to as the New Bridge, lending its name to New Bridge Road, the roadon its southern end. In 1865, the brick bridge was replaced by one made of not well constructed wood and, in 1886, an ironbridge was built to replace it. 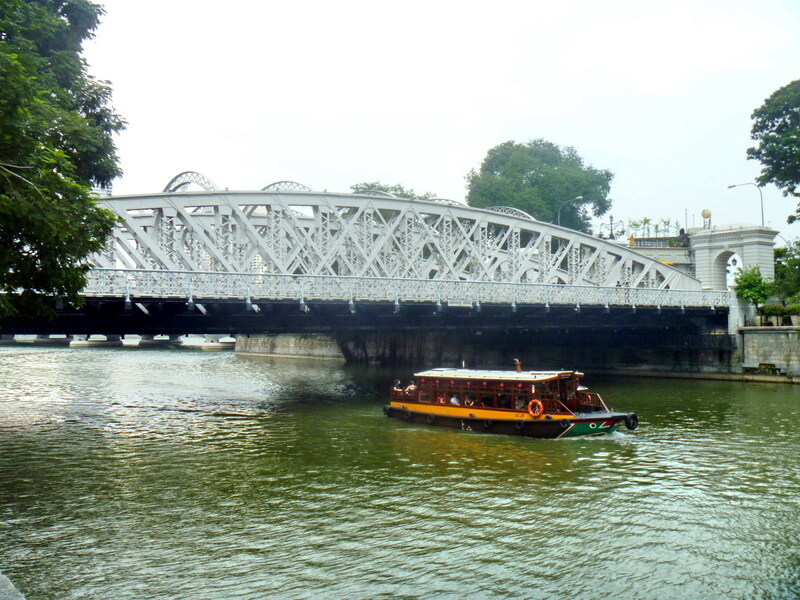 Considered one of the most attractive spanning the Singapore River, this iron bridge, however, was unable to cope with the increasingly heavy traffic flow between New Bridge Road and Hill Street and was finally demolished in 1986 and was replaced by the present concrete bridge. However, in recognition of its historical significance, the new bridge incorporated several features of the iron bridge such as the decorative lamp posts and iron railings. The Coleman Bridge is known, in Cantonese, as yi ma lo khiu (“the bridge at the second road”). 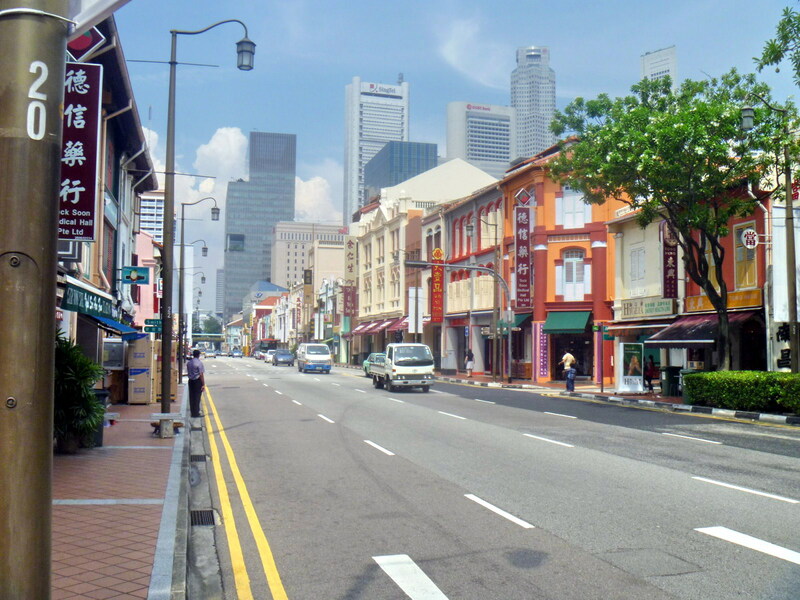 From Tanjong Pagar, we crossed over to the Chinatown district via South Bridge Rd. This traditional Chinese precinct is bounded by South Bridge Rd., Kreta Ayer Rd., New Bridge Road and Upper Cross St.. South Bridge Road is unique, being an example of Singapore’s multi-racial and multi-religious community, with the Sri Mariamman Temple (1827), Jamae Mosque or Masjid Chuliam (1830), Fairfield Methodist Church and Buddha Tooth Relic Temple and Museum (2007) are all located here. 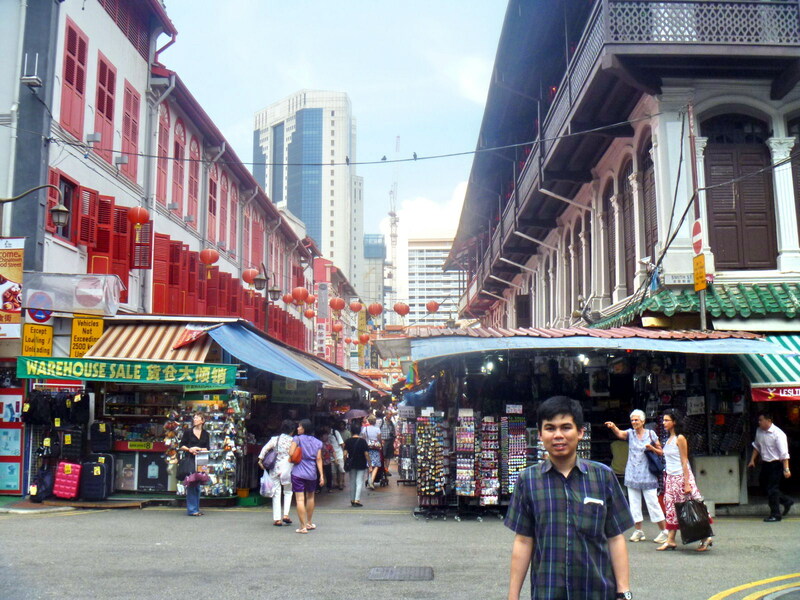 In 1843, the area was leased or granted to the public for the building of shophouses, many of which doubled as shops, warehouses, family quarters and workers dormitory. 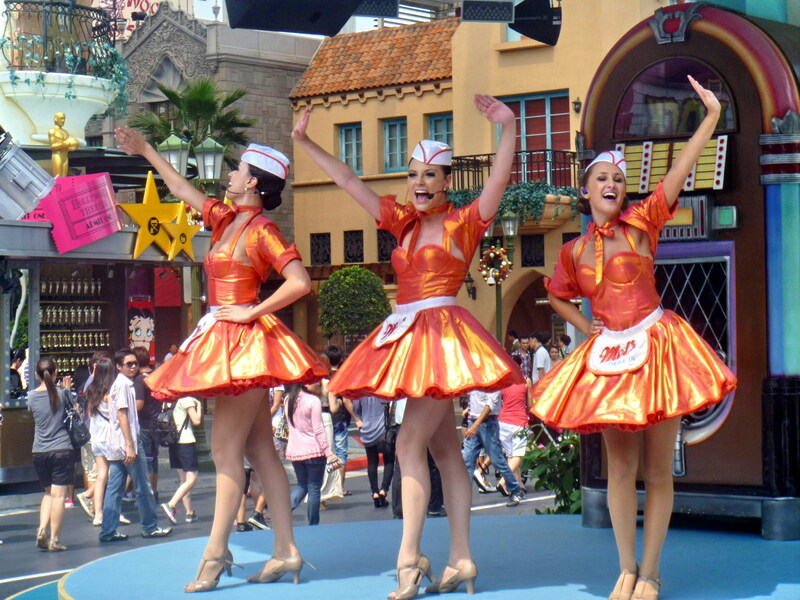 They display strong Fujianese, Teochew and Cantonese influence. Today, relatively little has changed with the original buildings in the area. 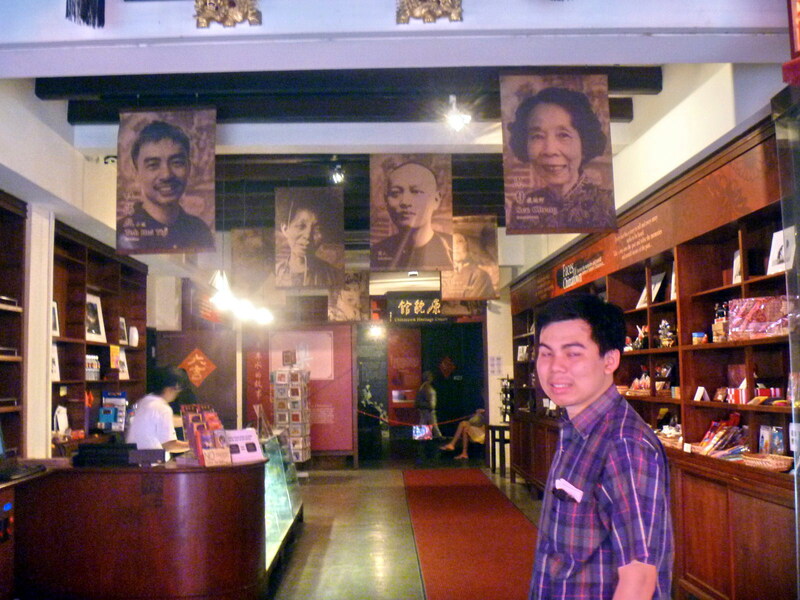 Jandy and I first visited the Buddha Tooth Relic Temple and Museum. This S$62 million temple, its architectural style based on the Tang Dynasty, was built in 2007 to house the tooth relic of the historical Buddha found in 1980 in a collapsed stupa in Myanmar. 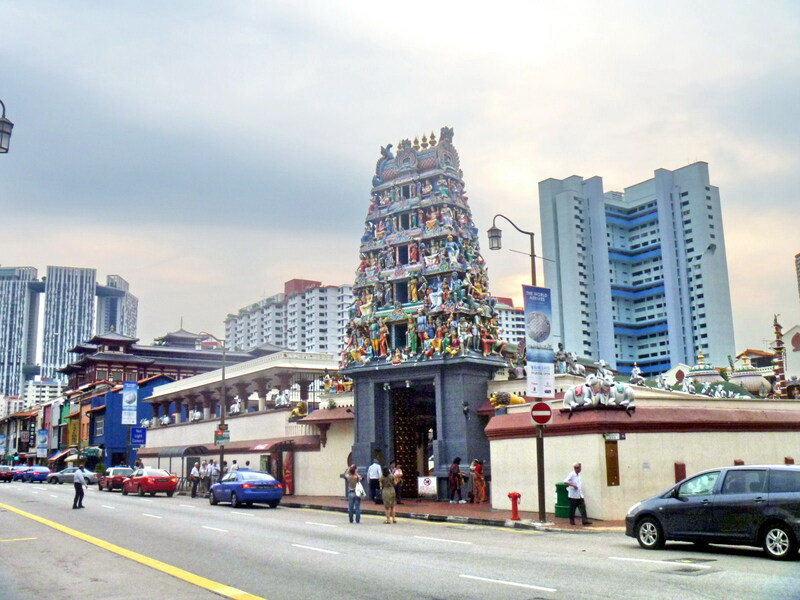 Sri Mariamman Temple, with its landmark ornamental tower entrance (gopuram), is the oldest Hindu temple in Singapore. More popularly known as Mariamman Kovil or Kling Street Temple, it was first built in 1827 by immigrants from the Nagapatnam and Cuddalore districts of South India. 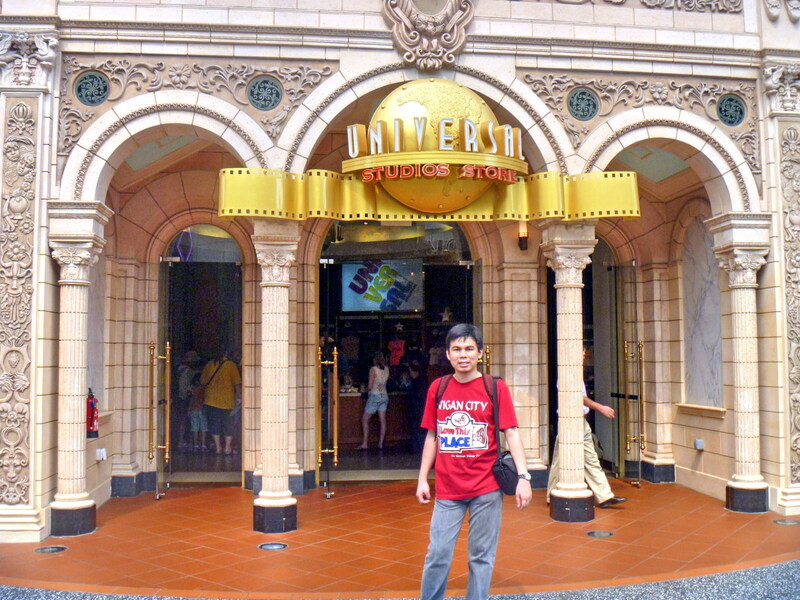 However, unlike my first visit here in 1992, I wasn’t allowed to take pictures inside. In 1843, the temple was rebuilt in plaster and brick and, in 1962, a new temple structure with intricate sculptural works reminiscent of temple architecture in India was built. The original gopuram, built in the late 1800’s, was rebuilt in the 1930s and, in the 1960s, was repaired and restored with elaborate proliferation of sculptures. 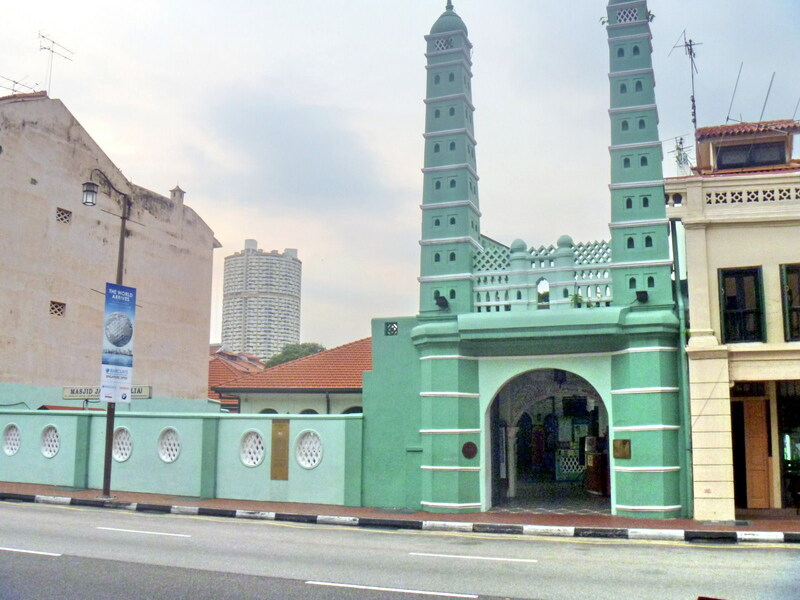 The nearby Jamae Mosque, on the other hand, was built in 1826 by the Chulias (Tamil Muslims). Its unique architectural style is eclectic. The entrance gate is distinctively South Indian while the 2 prayer halls and the shrine are in the Neo-Classical style typical of George Drumgoole Coleman. The mosque was gazetted a National Monument on 29 November 1974. Kreta Ayer, considered by many to be the heart of Chinatown, houses the Chinatown Heritage Center, Chinatown Night Market and Chinatown Food Street. 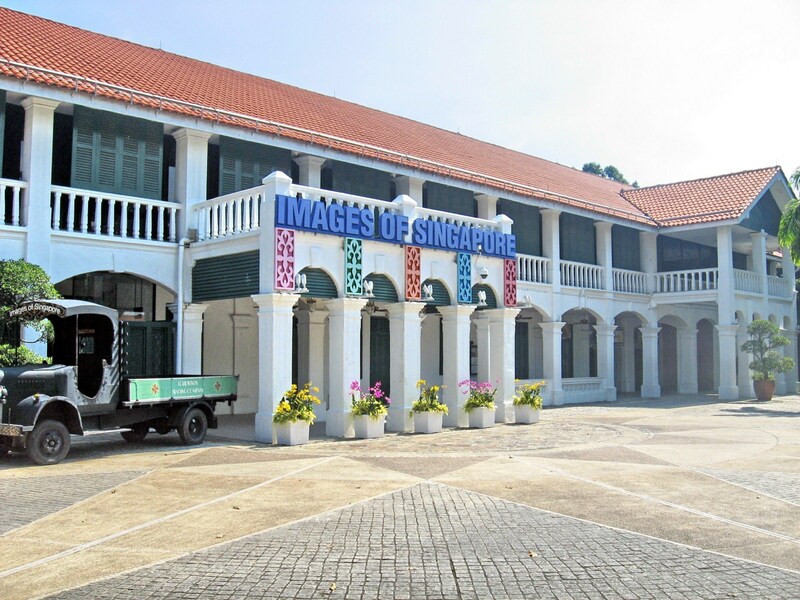 The newly-restored Chinatown Heritage Center, occupying 3 shophouses along Pagoda St., houses memories and untold stories of Singapore’s early forefathers. The Chinatown Complex, along Smith Street, houses a wet market and shops selling sundry goods. 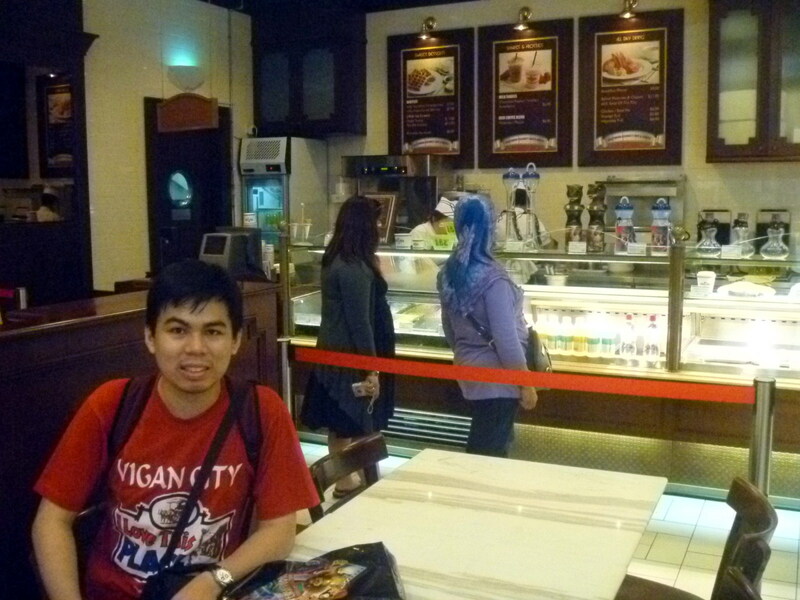 At its second floor food center, Jandy and I indulged in some authentic Singaporean hawker food fare for lunch. 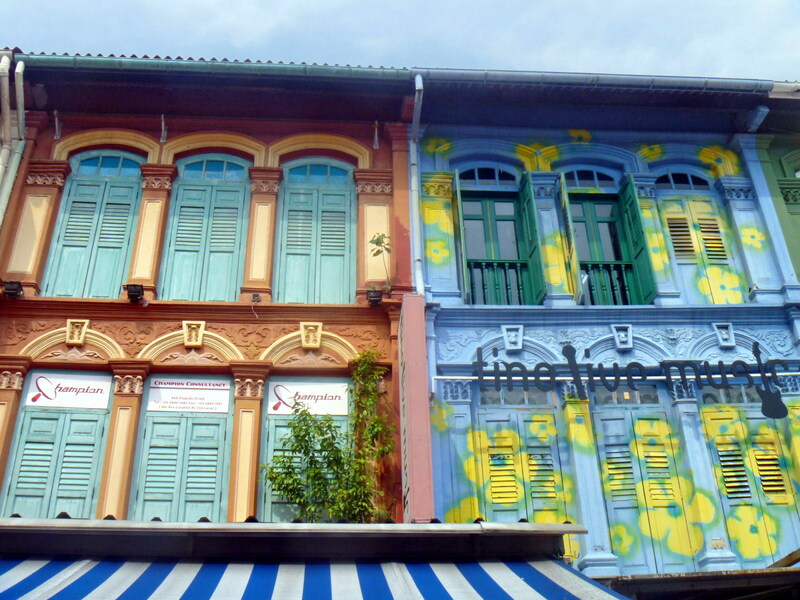 Shophouses do not have a single classification, combining different elements of Baroque and Victorian architecture with narrow wooden jalousies (often with adjustable slats) and decorative fanlights over the windows and pilasters, balconies and plasterwork seemingly Mediterranean in flavor. 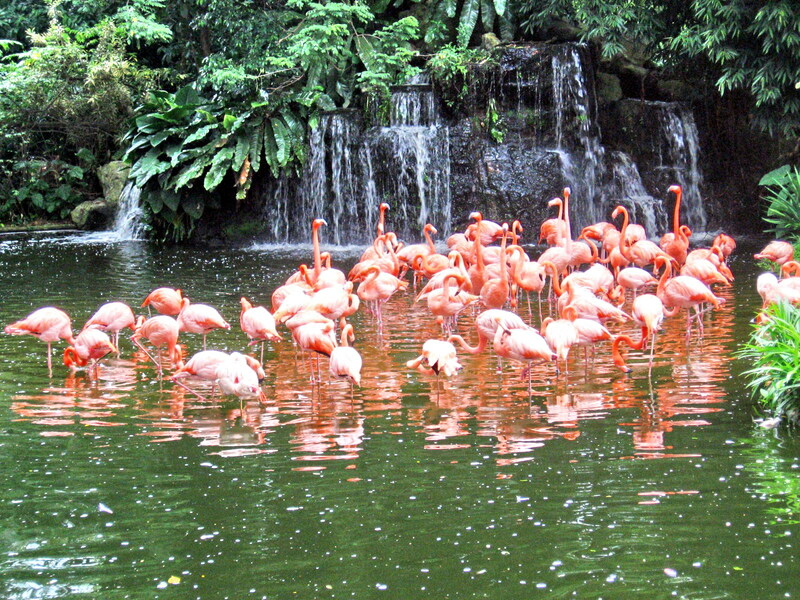 Many of them are painted in a variety of different pastel colors. 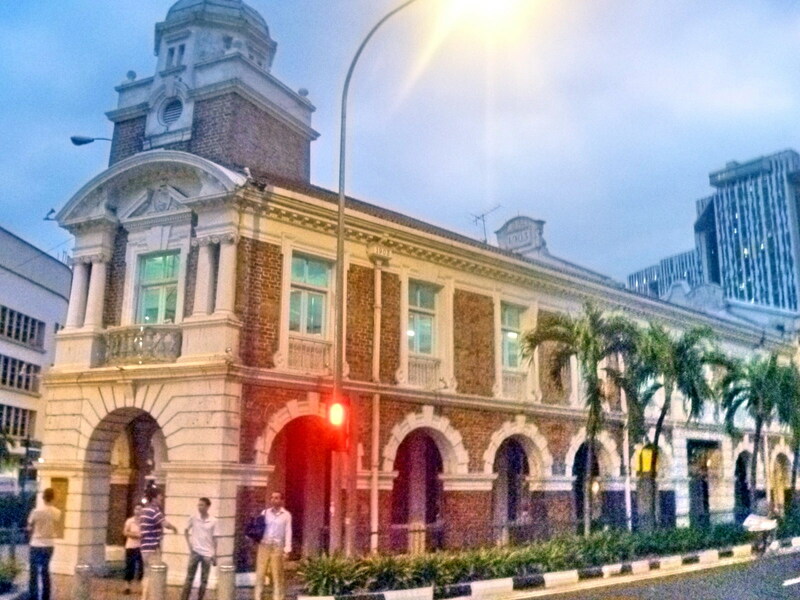 Trengganu St. (converted into a pedestrian mall transformed into a night market after dark), Pagoda St. and Temple St. as well as development in Upper Cross St. and the houses along Club St. are examples of this type of architecture. 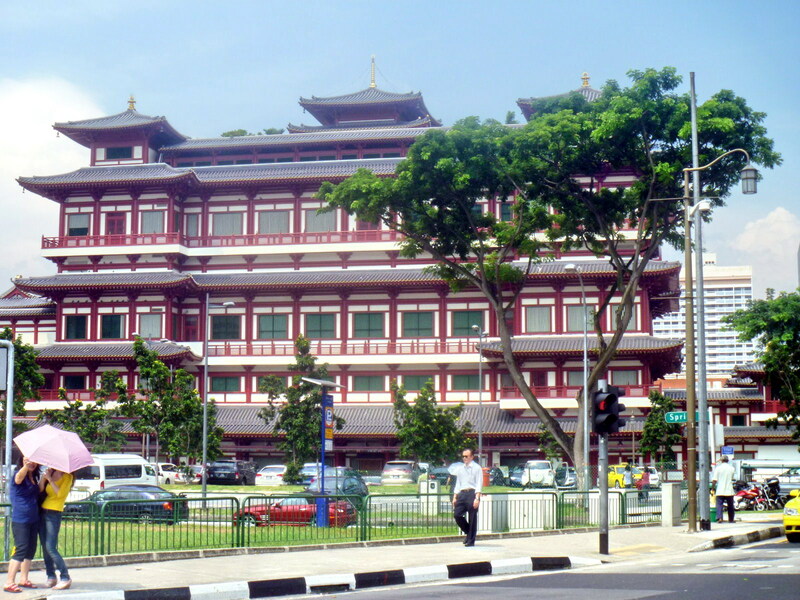 Buddha Tooth Relic Temple and Museum: 288 South Bridge Rd., Singapore 058840. Tel: 6220 0220. Fax: 6220 1261. Open daily, 7 AM-7 PM. 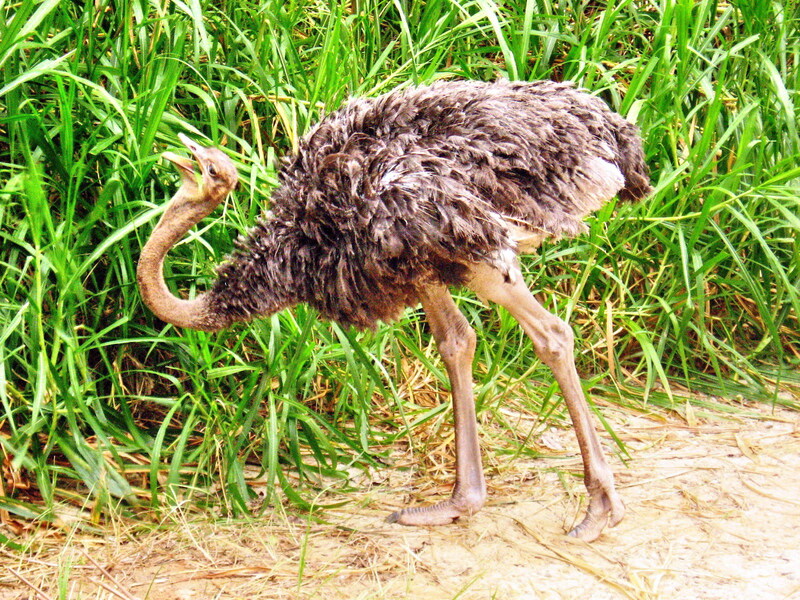 E-mail: services@btrts.org.sg. Website: www.btrts.org.sq. After a Big Mac lunch at a nearby MacDonald’s outlet and a short nap at our hotel room, Jandy and I started our own walking tour of the city. The Amara Hotel Singapore was within walking distance to the Tanjong Pagar Conservation District, along the fringes of Chinatown and Raffles Place. 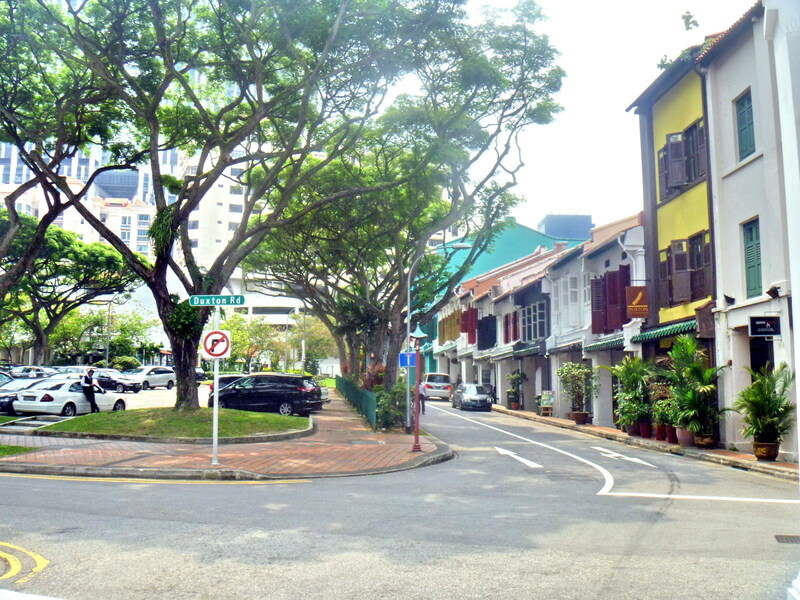 Characterized by soaring skyscrapers and rows of exquisitely preserved pre-World War II shophouses, it is bounded by Neil Rd., Maxwell Rd., Peck Seah St., Wallich St., Tanjong Pagar Rd. and Craig Rd.. 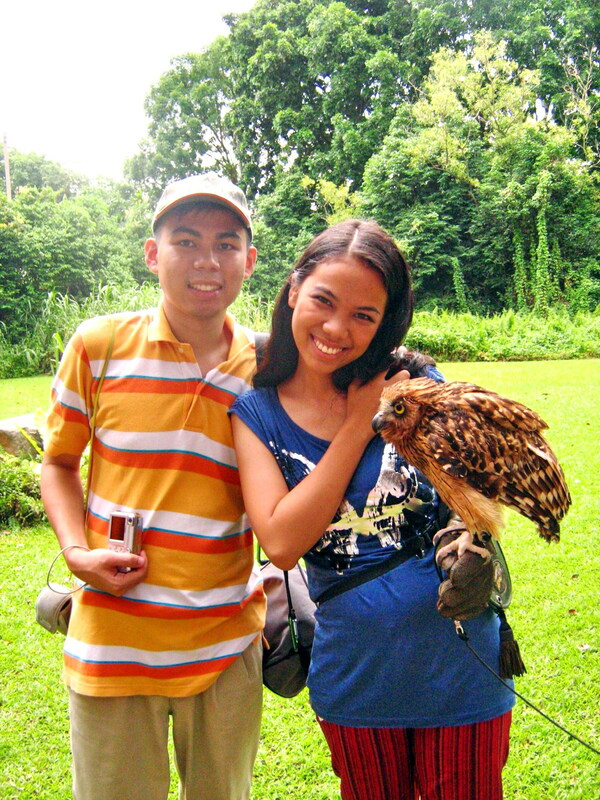 This was first in our itinerary. This historic district was formerly a Malay fishing village and, from the mid 19th century, an enclave for thousands of immigrant Chinese and Indian dock workers (Tanjong Pagar was where Singapore’s waterfront used to be before reclamation). It was also once the lucrative center of operations for rickshaw pullers awaiting clients and their presence was so prevalent that, in 1904, the government established a Jinricksha Station, Singapore’s last reminder of the once ubiquitous rickshaw, at the junction of Tanjong Pagar Rd. 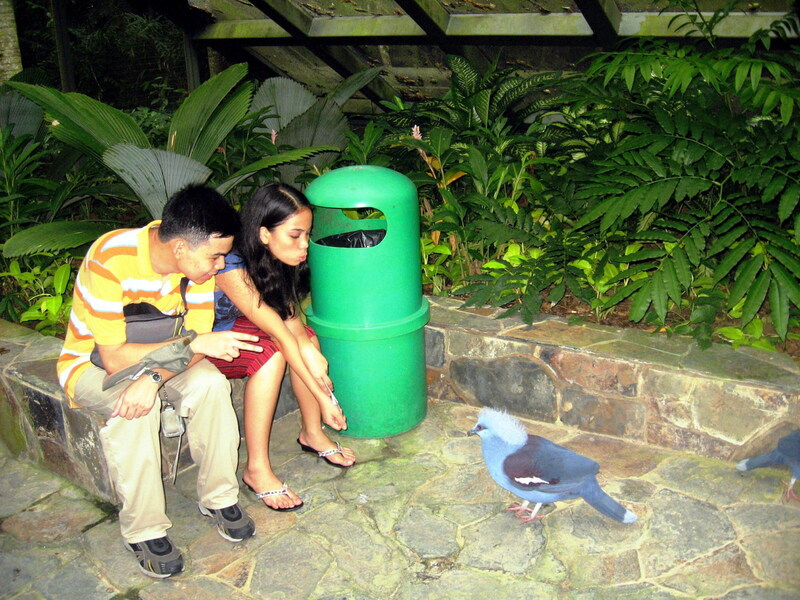 and Neil Rd..
On July 7, 1989, Tanjong Pagar became the first area to be gazetted under the Singapore government’s conservation plan. Many of the area’s more than 200 2 and 3-storey shophouses of the Early, Transitional and Late Shophouse Styles, built between 1870 and 1940, were beautifully restored to their original appearance. 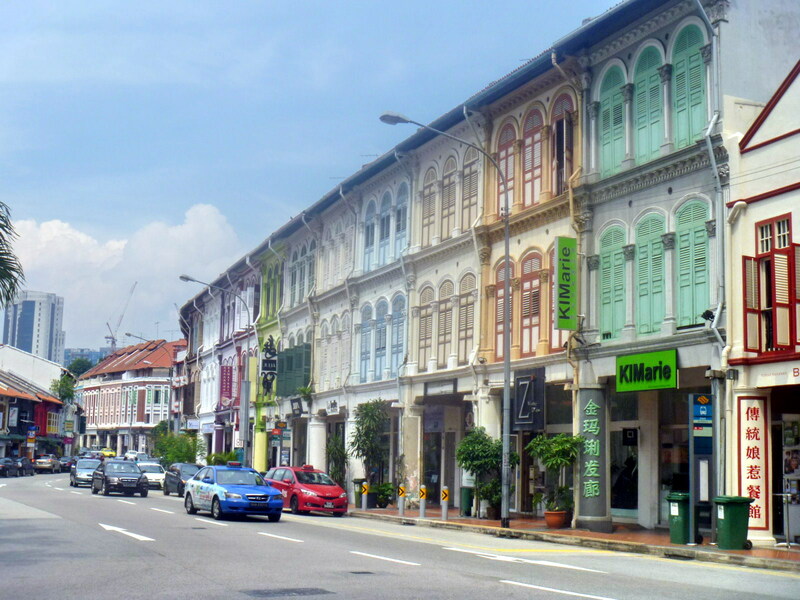 Today, it has become a fashionable district, her rows of shophouses filled with thriving businesses such as cafes, bars, a large number of bridal saloons and restaurants. The slopes of Duxton Hill was the site of a 13-hectare nutmeg plantation owned by Dr. J.W. Montgomerie (1797–1856), who was an Assistant Surgeon in the service of the Government. Upon his death, the land was auctioned off and 14 acres went to Syed Abdullah bin Omar Aljunied, an Arab who divided them into 4 lots which were leased to wealthy Straits Chinese developers who, by the 1890s, had built 2 and 3-storey shophouses. 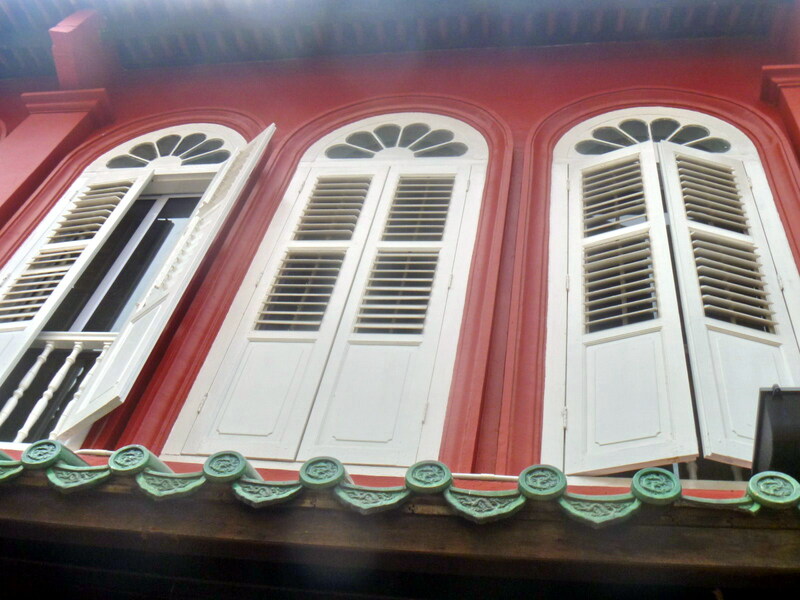 The earlier shophouses, of Chinese design, feature low, squat proportions and minimal ornamentation while later ones combined colonial and ethnic elements such as Chinese panel frescoes and Malay timber fretwork. 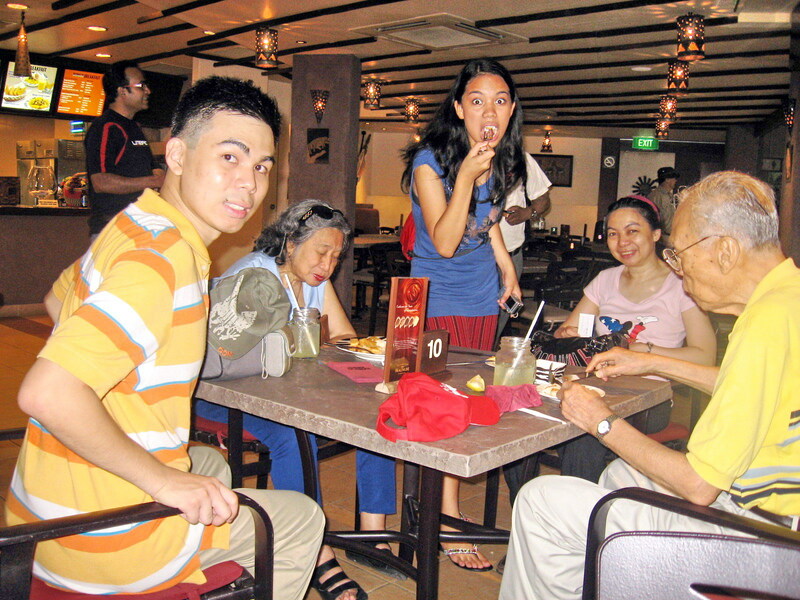 After our Singapore Flyer “round” trip, we had a late lunch at Seafood Paradise. 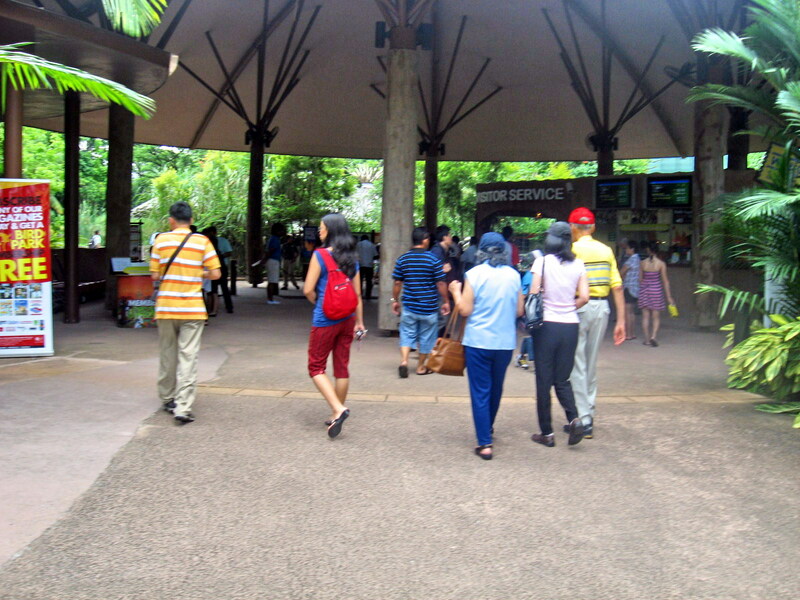 Next in our itinerary was Sentosa and, to get there, we again boarded 2 taxis and dropped off at Sentosa Imbiah Station. 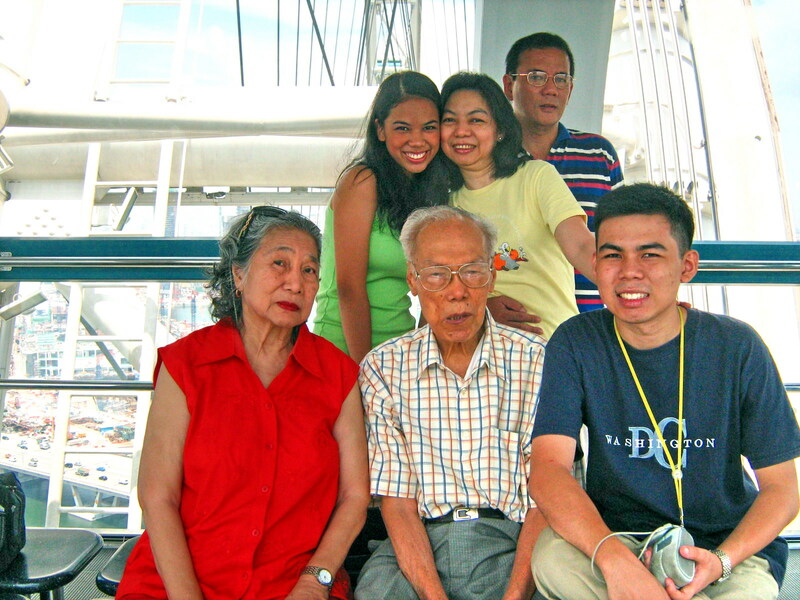 Upon arrival, we all first tried out the Tiger Sky Tower, Singapore’s tallest free-standing observatory tower, opened on February 7, 2004. Once inside the large, 72-pax air-conditioned, disc-shaped cabin fitted with glass windows all round, it then revolved slowly as it ascended the column of the tower to a maximum height of 131 m. above sea level (110 m. above ground). 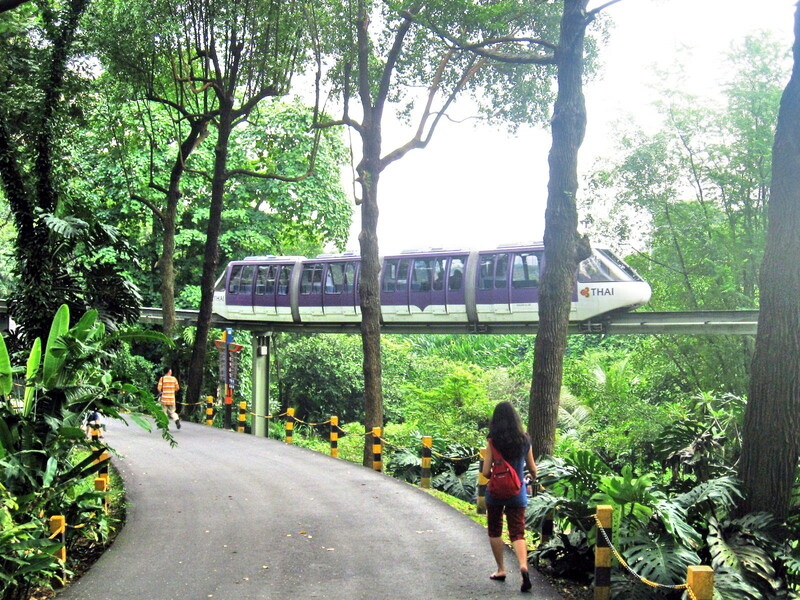 On the way up, we enjoyed panoramic views across Sentosa, Singapore’s southern islands and neighboring Malaysia and even Indonesia. 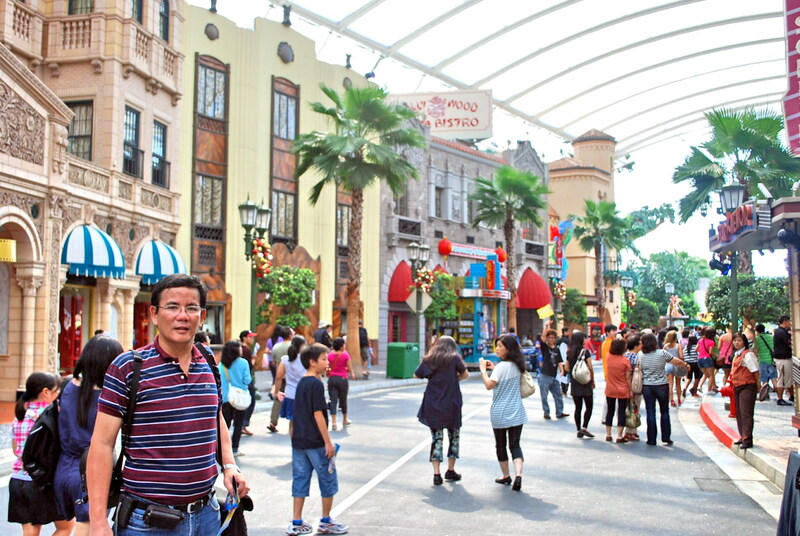 After our tower ride, we walked to the nearby Images of Singapore building to try out Singapore’s award-winning attraction – the Images of Singapore. A quick peek into Singapore’s history, culture and heritage, this walk down memory lane was the second for me and Grace and the first for the rest. 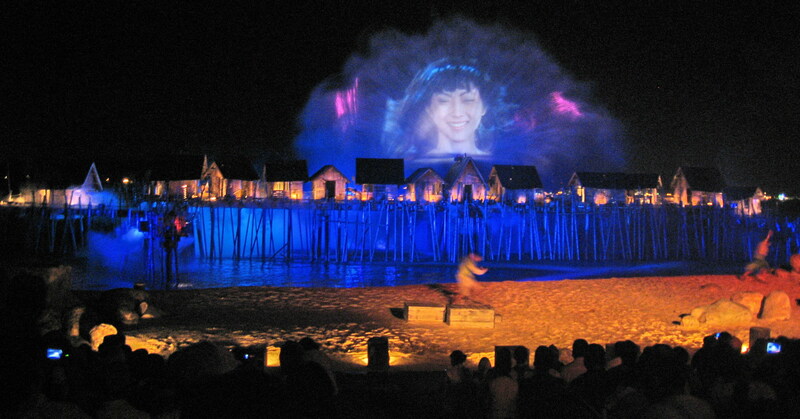 A journey to the very soul of the nation, it brings the country’s past back to vivid life using multimedia displays, multi-screen theater presentations and life-sized tableaus depicting local history. 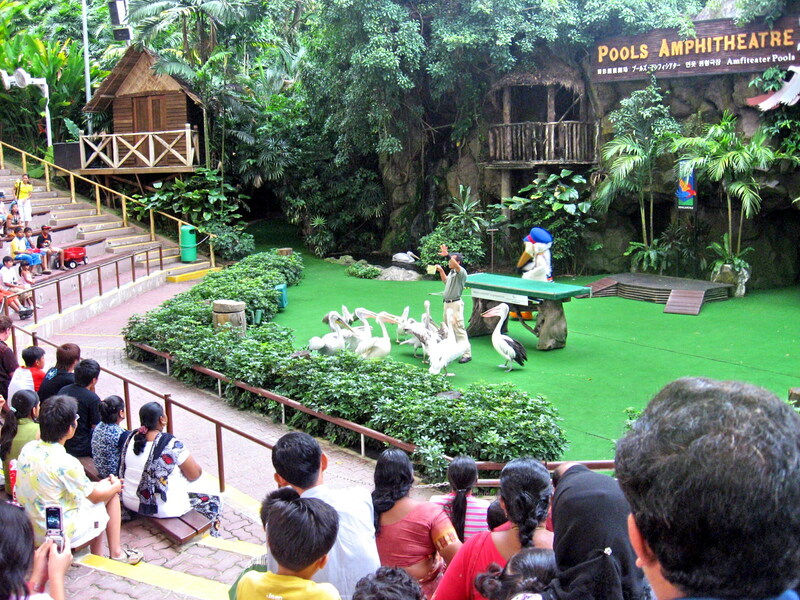 Here, legend, facts and folklore are creatively interwoven into an “I am there” experience as we journeyed from the earliest days of Singapore’s founding, when Sir Thomas Stamford Raffles stepped along the banks of Singapore River, to today’s modern Singapore where cultural diversity, unity of values and adventure converge. 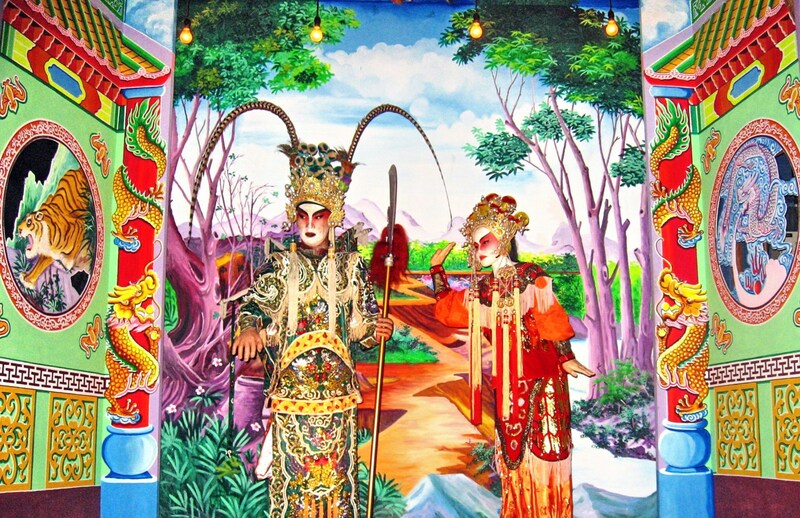 We were also amazed by the many colorful festivals celebrated in Singapore. 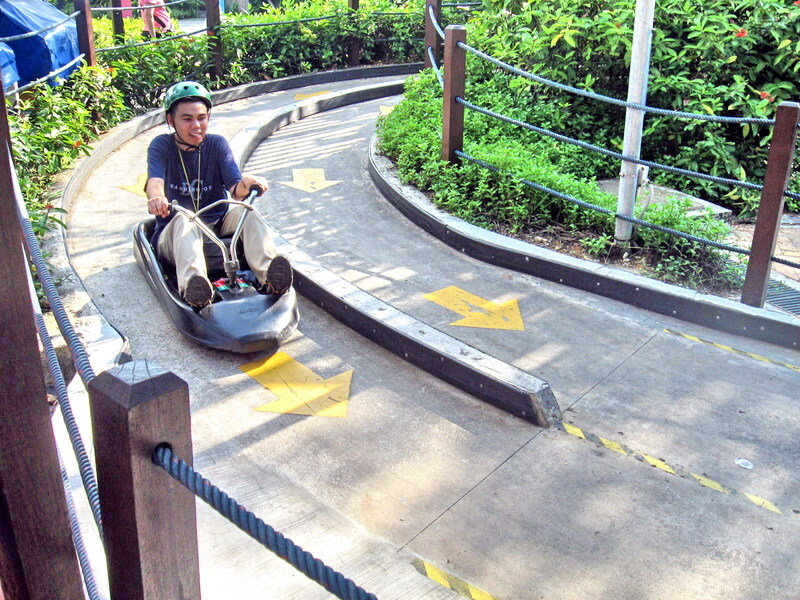 After our Images of Singapore, Jandy, Cheska and I tried out the non-motorized Luge, a self-steering, gravity-driven 3-wheel cart, originally from New Zealand, that is part go-cart, part toboggan. 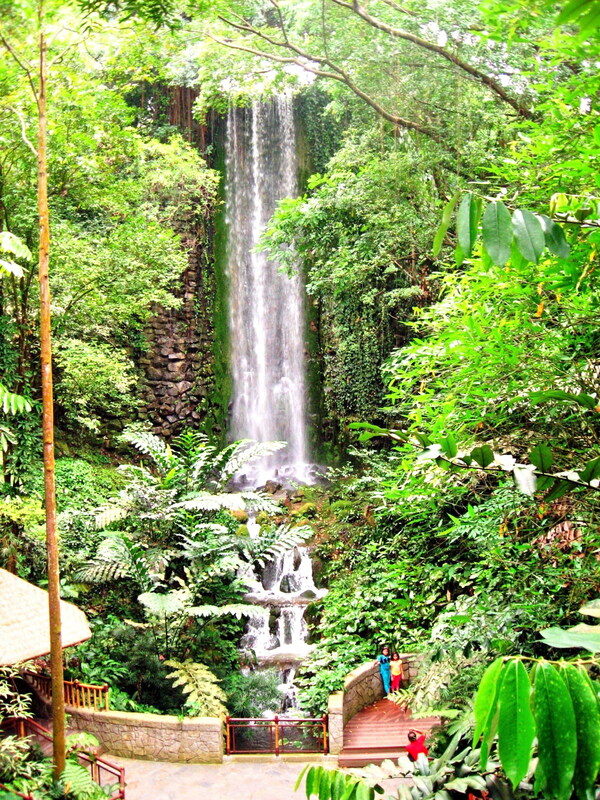 Here, we all navigated 650 m. down the Jungle Trail or 688 m. down the Dragon Trail with the option to go thrillingly fast or to cruise slowly as we went down the hill to Siloso Beach. Truly a unique outdoor experience. 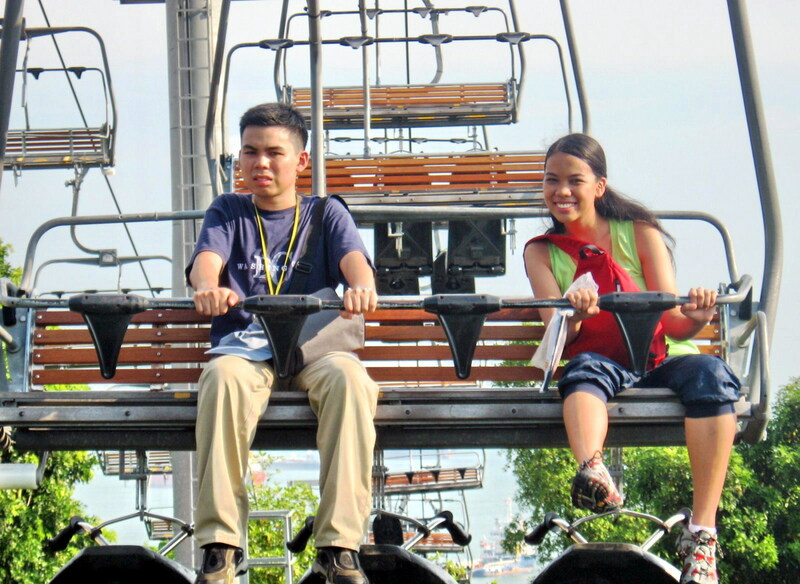 After the Luge, we next boarded the Skyride, along the way taking in the panoramic and breathtaking scenery of the city skyline, harbor and beautiful coastline. The used luges are also slung underneath our seats for transport back up the hill. 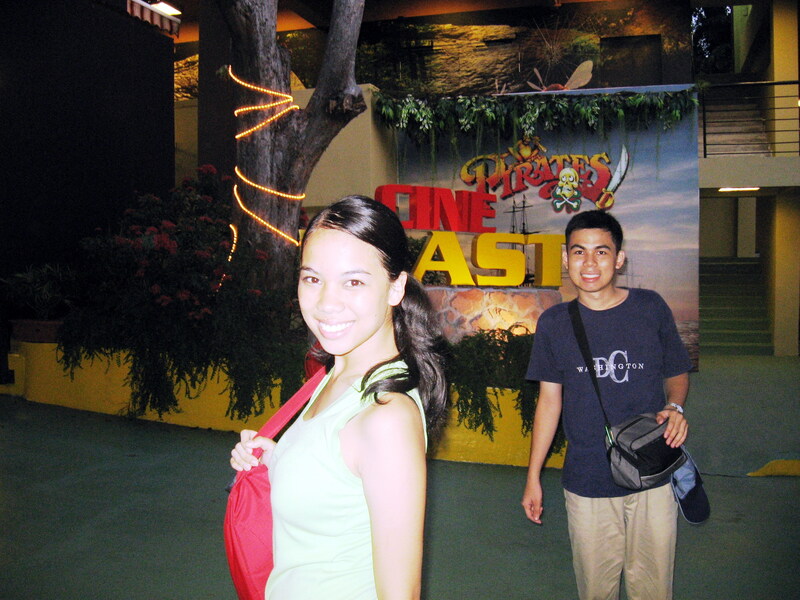 Come evening, we proceeded to the S$4.5million Cineblast, opened in June 2007, to watch “Extreme Log Ride,” Singapore’s only cinema ride. 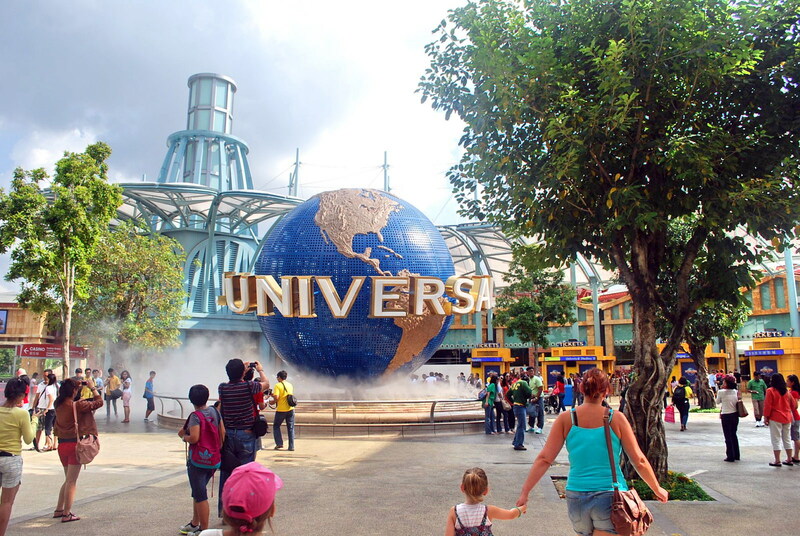 This thrilling, 4-dimensional, motion-simulated “ride of your life” combines the virtual “roller coaster” rides with high-definition wide-screen projection. Here, we all sat inside a cyclone unit that is mounted onto a 6-axis system and then experienced amazing real-life thrusts and motion unlike any other as we felt the exhilaration of flying to the top of the highest mountain, the stomach-churning virtual thrill of rushing into the deepest valleys, and the gripping excitement of being tossed about by whitewater rapids. 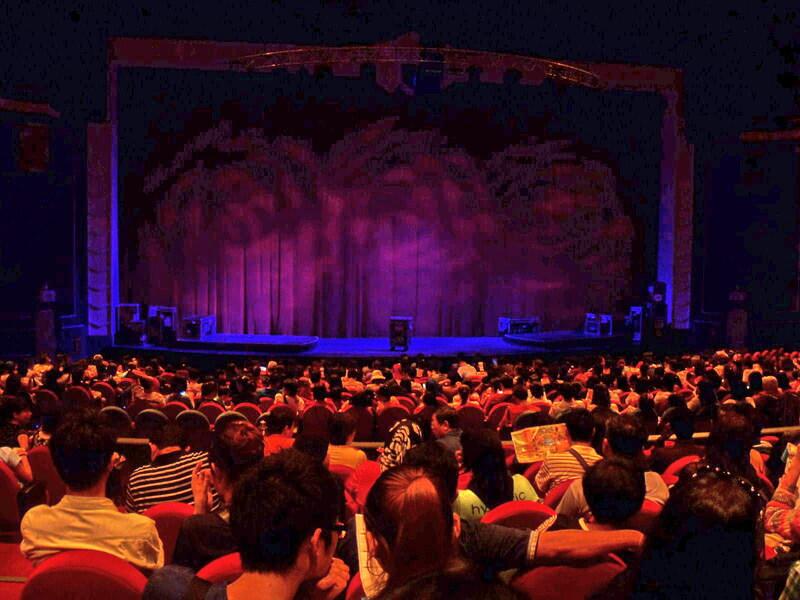 Next, we moved on to the S$3.5 million Sentosa 4D Magix Theater, opened on January 2006, to watch the comedy “Pirates!” This whole new generation in movie magic, the first in Southeast Asia, is an interactive movie experience with 4-dimensional digital effects, using a state-of-the-art digital projection system and a DTS 6.1 sound system. We were seated on a motion-based chair equipped with a wide spectrum of special visual, sound, motion and environmental effects such as built-in speakers as well as environmental effects like water features, seat vibration, leg ticklers and base shakers, placed us right in the middle of the action. 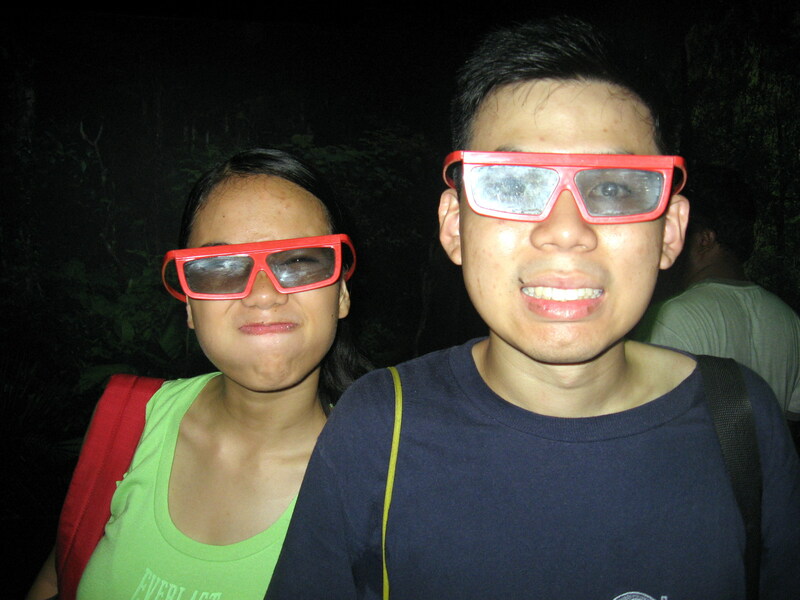 During the 3-D show, visual effects kept popping out of the big screen, we were tossed about in our seats, felt the wind blowing in our face and the water rushing our way, all environmental effects that provided a life-like feel. 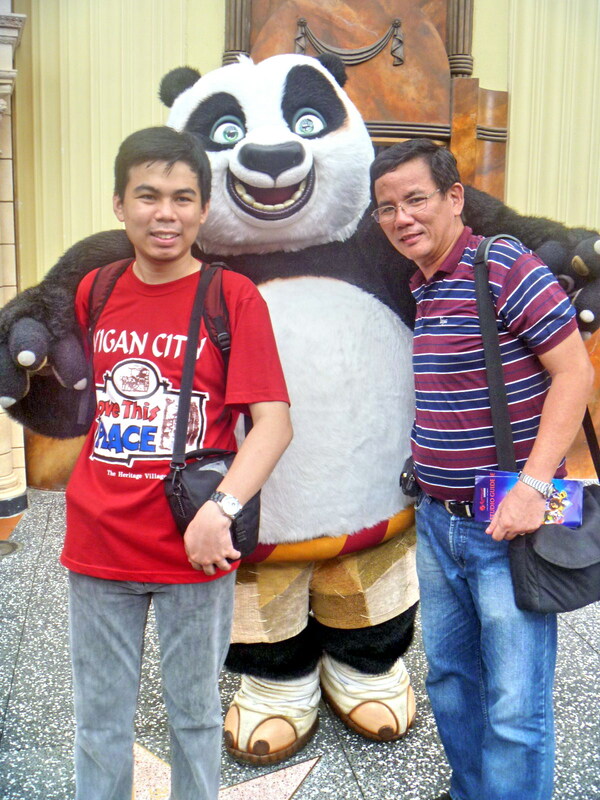 We again met up with the others at the 2,500-pax, open-air Palawan Amphitheater for the 7:30 PM showing of the mesmerizing “Songs of the Sea.” This one-of-a-kind entertainment spectacle, with a live cast, features dramatic effects, pyrotechnics displays, water jets, flame bursts and lasers amid captivating music. 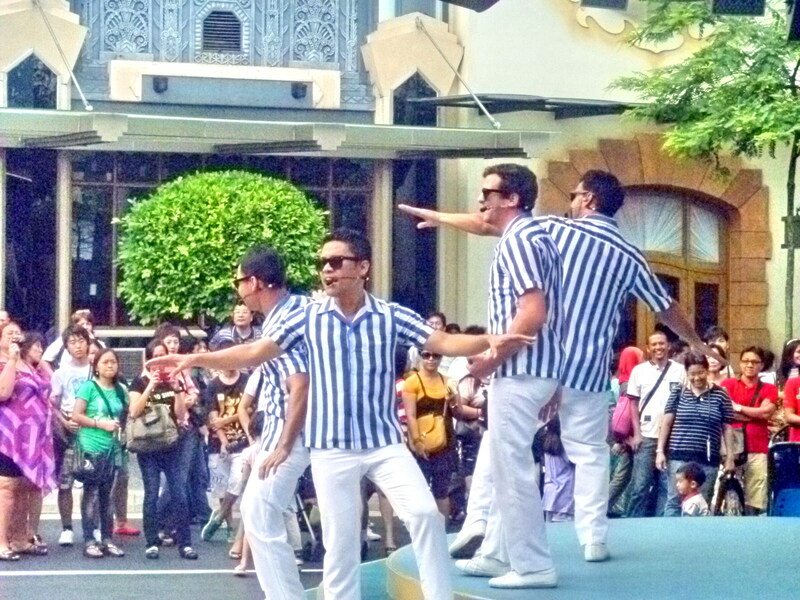 Truly, a performance we didn’t want to miss. 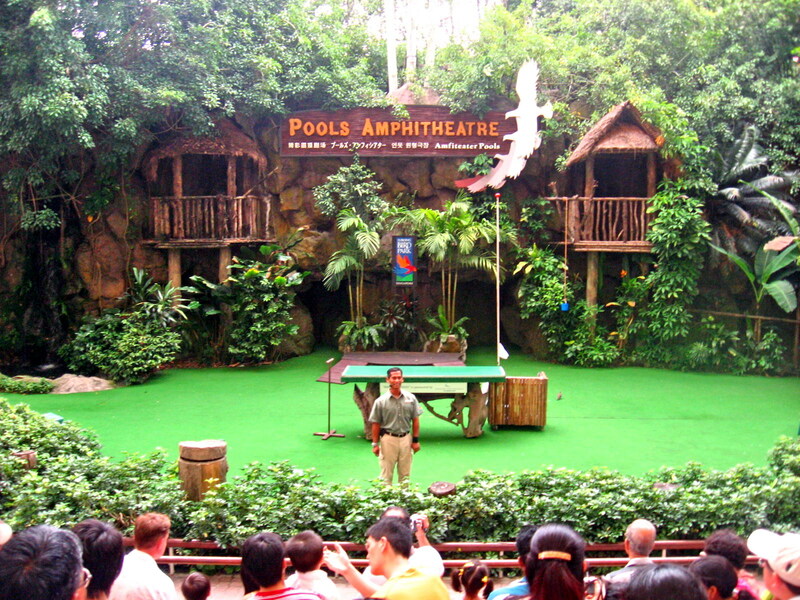 Designed by Yves Pepin, this show was started on March 26, 2007, replacing the 25 year old Magical Sentosa show. 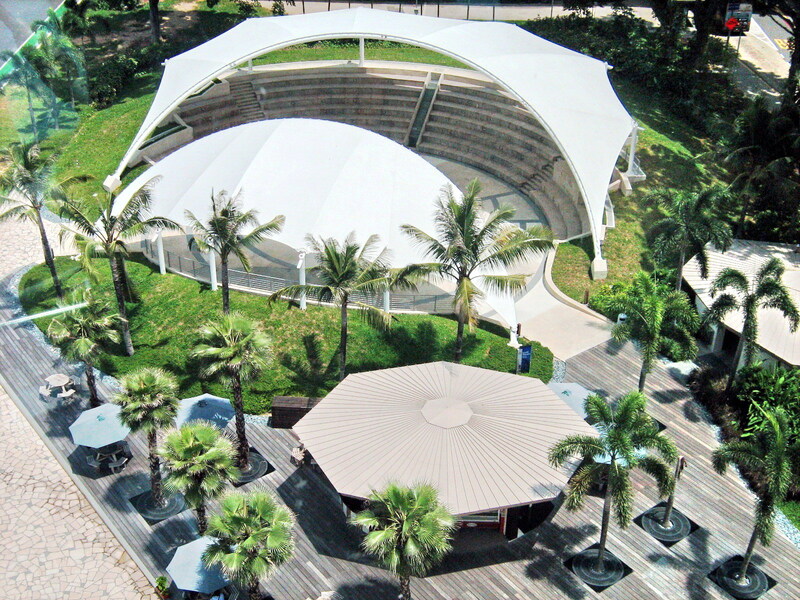 The water jets, water screens, lasers and projectors are hidden at the back of the 120 m. long Malay kampung (or kelong) by the sea. 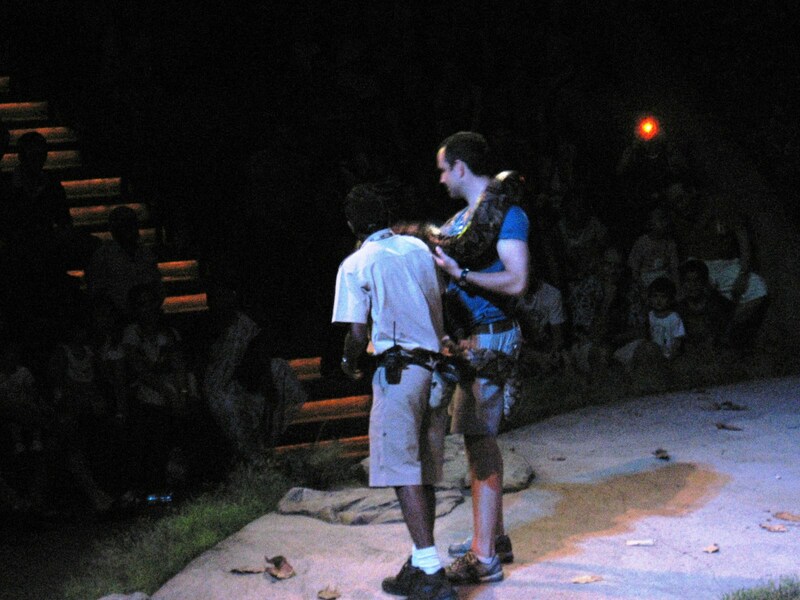 The show runs twice nightly. 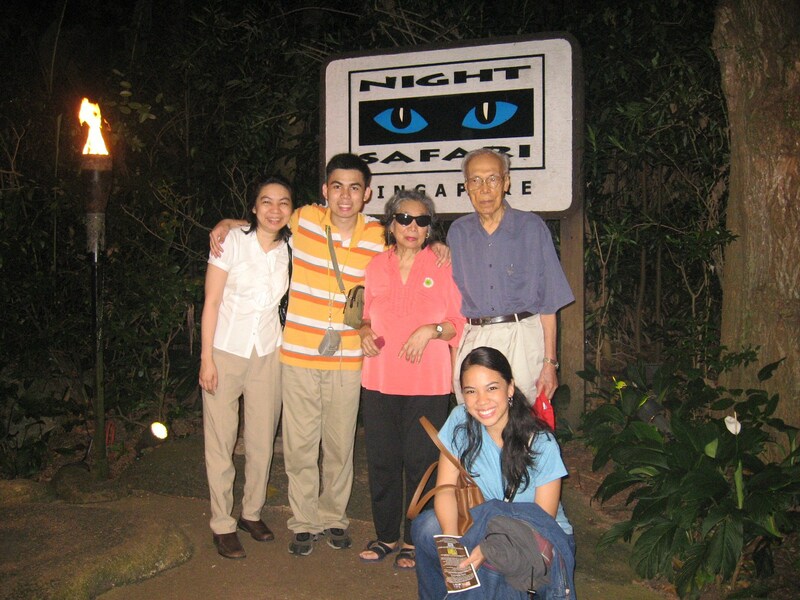 After the “Songs of the Sea” presentation, Grace accompanied Dad and Mom back to the hotel while Jandy, Cheska and I tried out the after-dark Go Green Segway® Eco Adventure, a first for all of us. 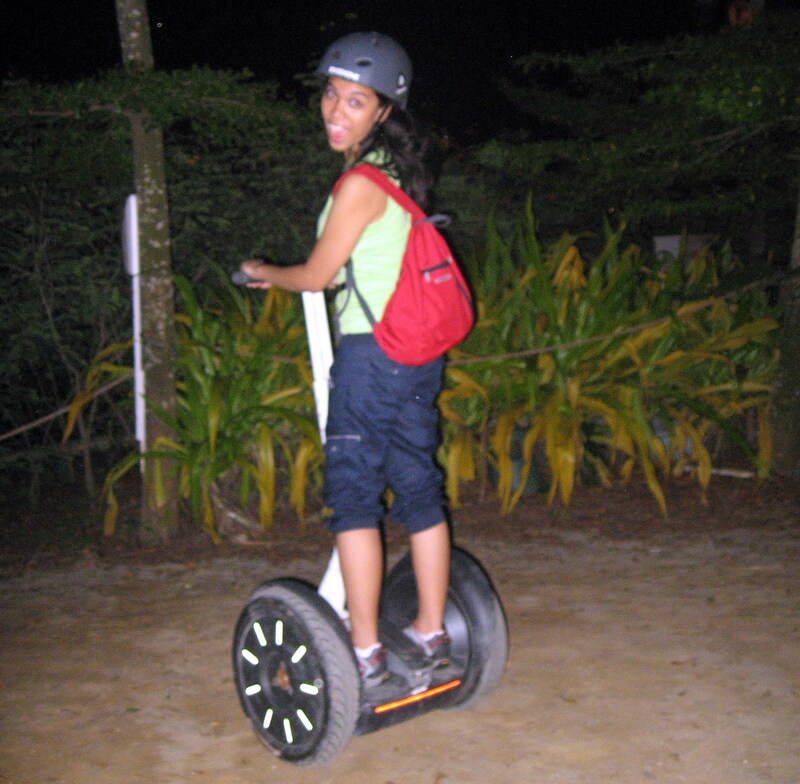 Here we tried out the Segway, a futuristic personal mobile transporter and mobility device, along a secure circuit. 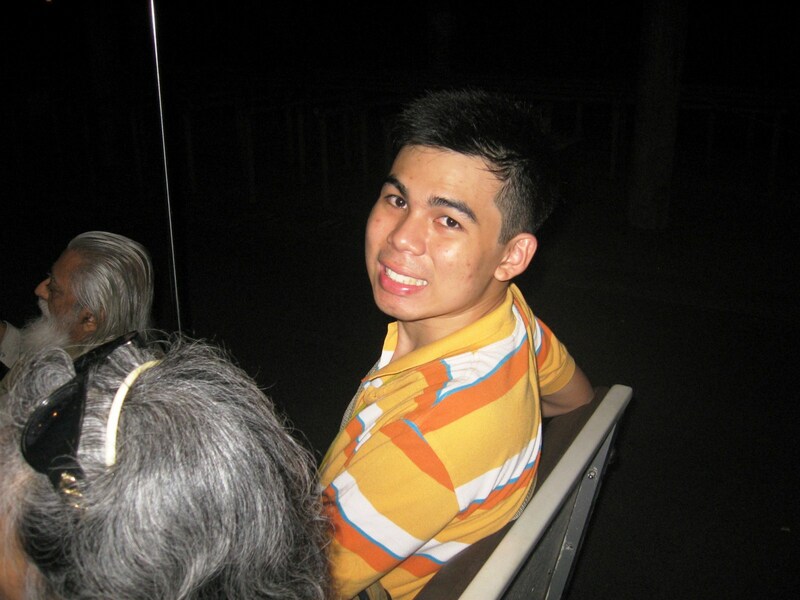 After the Segway ride, we had a late dinner at a 7-Eleven outlet and loll around, for some time, at Palawan Beach. 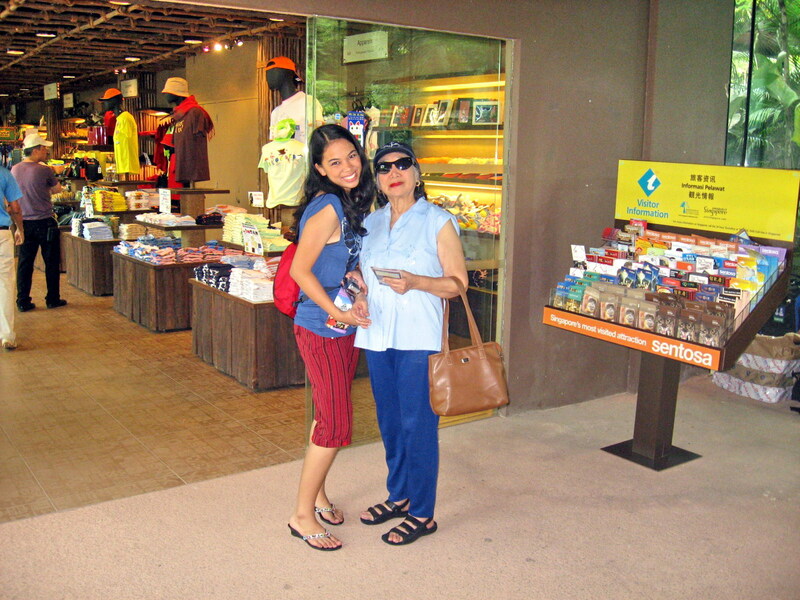 We, as well as many other tourists leaving Sentosa, waited a long time for the arrival of the monorail to Vivo City. 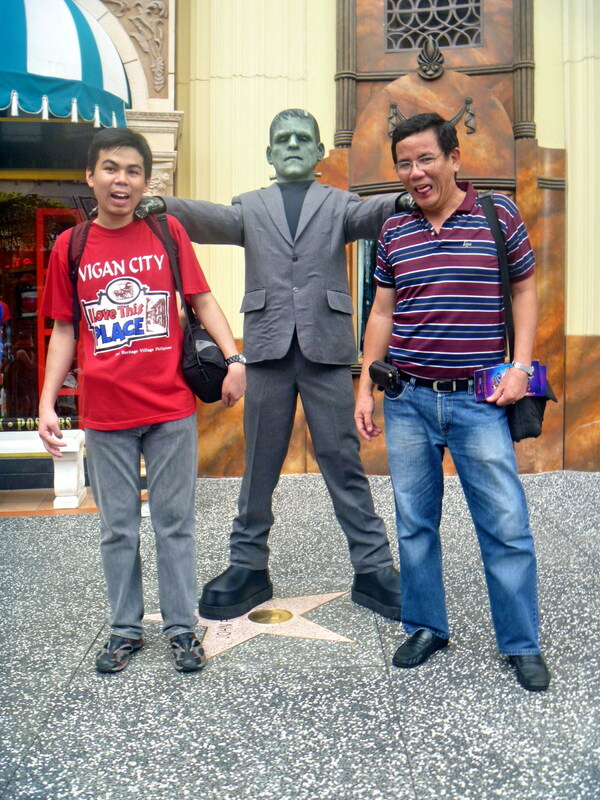 From Vivo City, we took the MRT to Dhoby Ghaut and then a taxi back to our hotel. 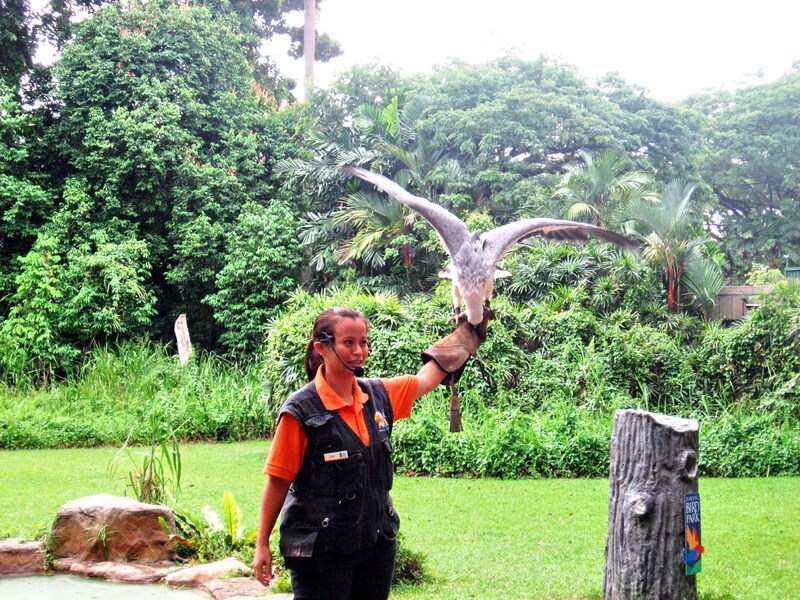 Sentosa Resort: 33 Allanbrooke Road, Sentosa Development Corporation, Singapore 099981. Tel: 6275 0388. 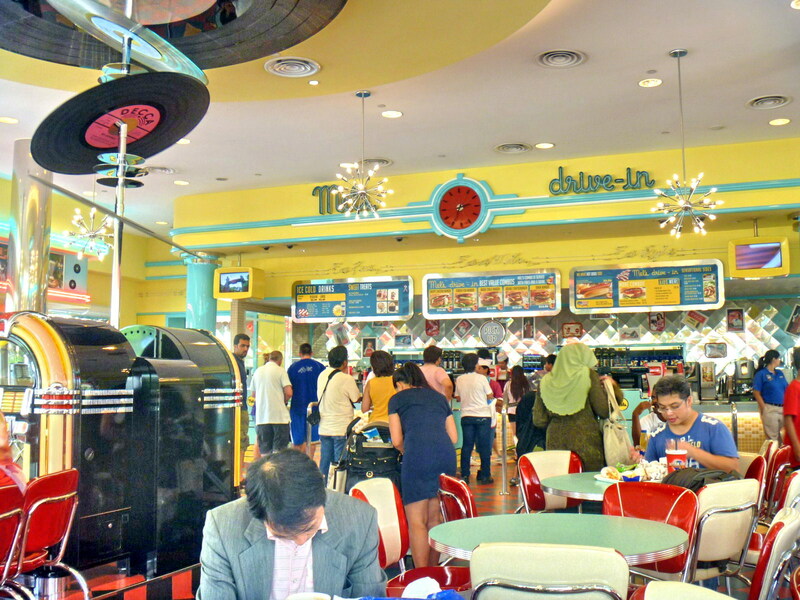 After breakfast at the hotel, we all left, on board 2 taxis, for the Singapore Flyer, a giant observation (management refuses to use the word “Ferris”) wheel at the Marina Promenade, located at the southeastern tip of Marina Center, near the shore of Marina Bay. We wanted to get a breathtaking and panoramic view of Singapore’s magnificent city skyline and what better place to do that than being 42 stories up in a 165 m. (541 ft.) high observation wheel. The tallest in the world, it is 5 m. (16 ft.) higher than the Star of Nanchang (People’s Republic of China) and 30 m., (98 ft.) higher than the London Eye (United Kingdom). 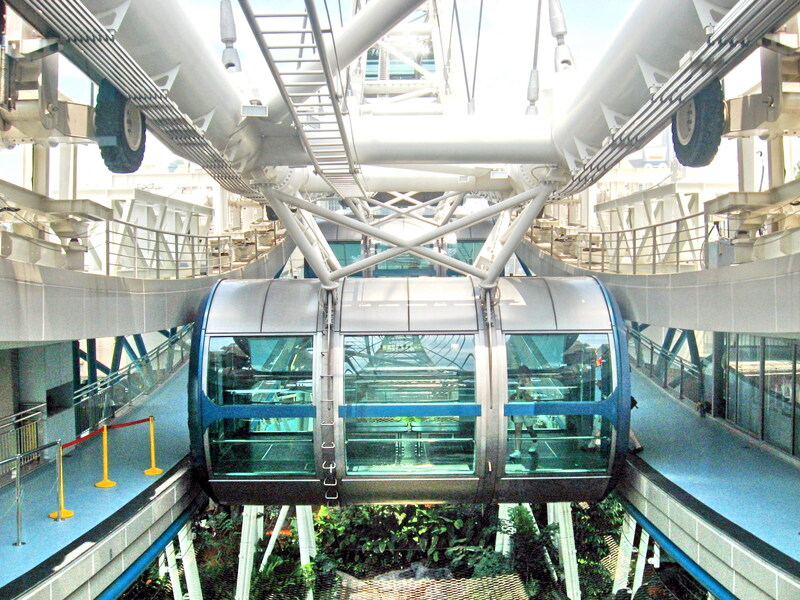 Designed by Arup and Mitsubishi Heavy Industries, the actual wheel has a diameter of 150 m. (492 ft.). 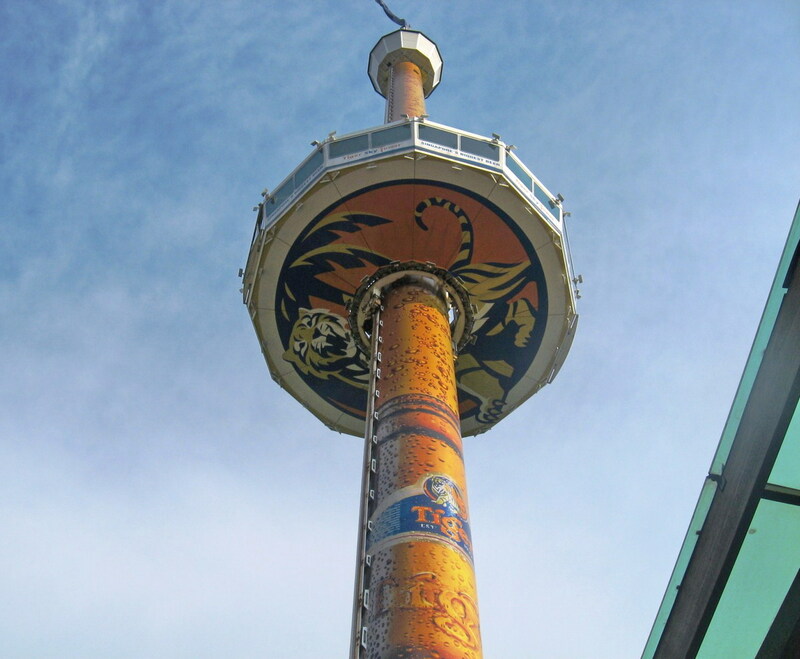 It was constructed from 2005–2008 and its final capsule was installed on October 2, 2007. The wheel started rotating on February 11, 2008 and it was officially opened to the public on March 1, 2008. Its grand opening was held on April 15, 2008. Initially, the wheel rotated in a counter-clockwise direction until, on the advice of Feng shui masters, its direction was changed on August 4, 2008. 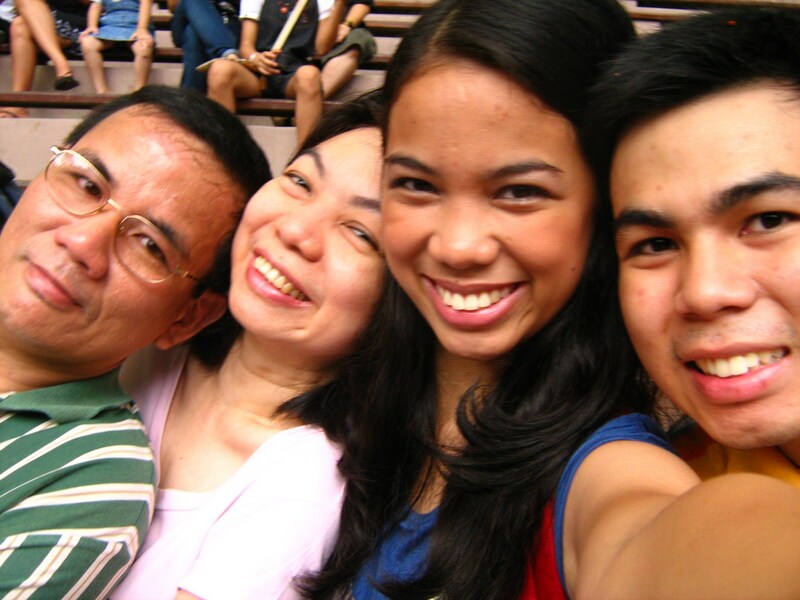 It was almost noon when we all arrived at the 3-storey, 16,000 sq. m.(172,000 sq. ft.) terminal building on which the wheel sits. The terminal houses shops, bars and restaurants, an adjacent open-air Greek-inspired theater along the waterfront, a jetty, roof gardens and a recreated rainforest (Rainforest Discovery) with waterfall in the terminal’s atrium. 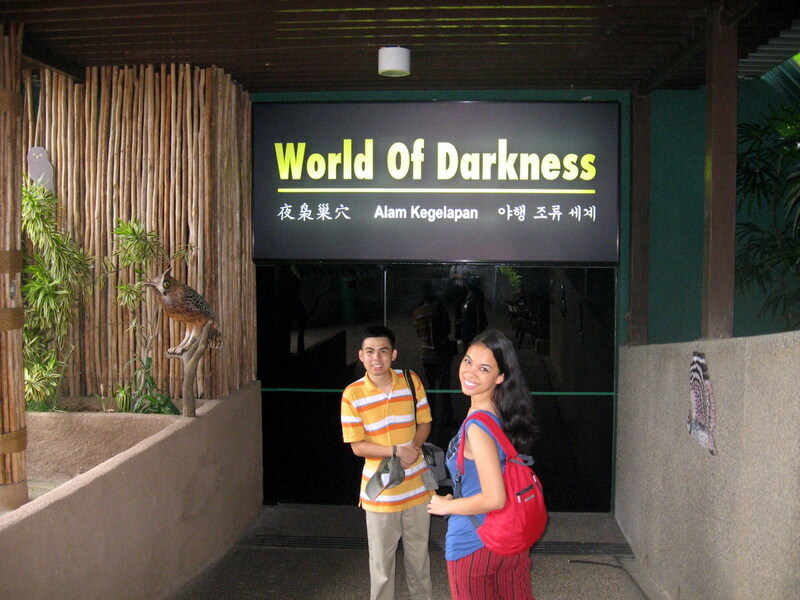 After paying the S$29.50 admission fee, we entered one of the 28 airconditioned, 28-pax, 26 sq. m. (280 sq. ft.) exo-capsules which, like those of the London Eye, are attached outward of the wheel structure, offering a continuously unobstructed view when the capsule is at the peak, unlike the more common endo-capsule. A complete clockwise (when viewed from Marina Center) rotation of the wheel takes approximately 37 minutes. 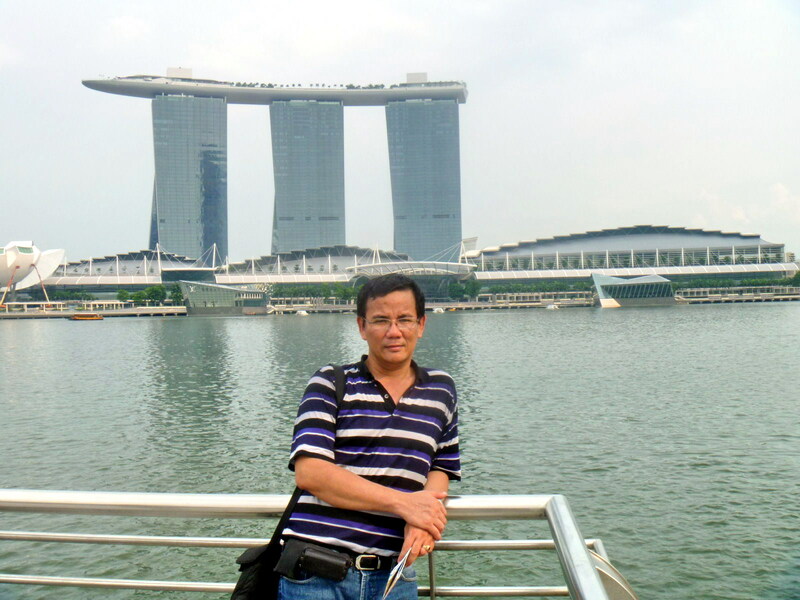 During all that time, we had a breathtaking, vibration-free view of Singapore’s iconic and historical landmarks, views from the Marina Bay to the Singapore River, City Hall, Raffles Place, Merlion Park, the Supreme Court Building, Empress Place and the Padang. We also had great 360 degree views of the Marina Bay Golf Course, Marina Bay Sands Integrated Resort (under construction) and the Float at Marina Bay; the Esplanade (Singapore’s performing arts venue), the 280 m. high UOB Plaza One Building (1 of Singapore’s 3 highest buildings) and the Flyer Theater below. Beyond, about 45 kms. 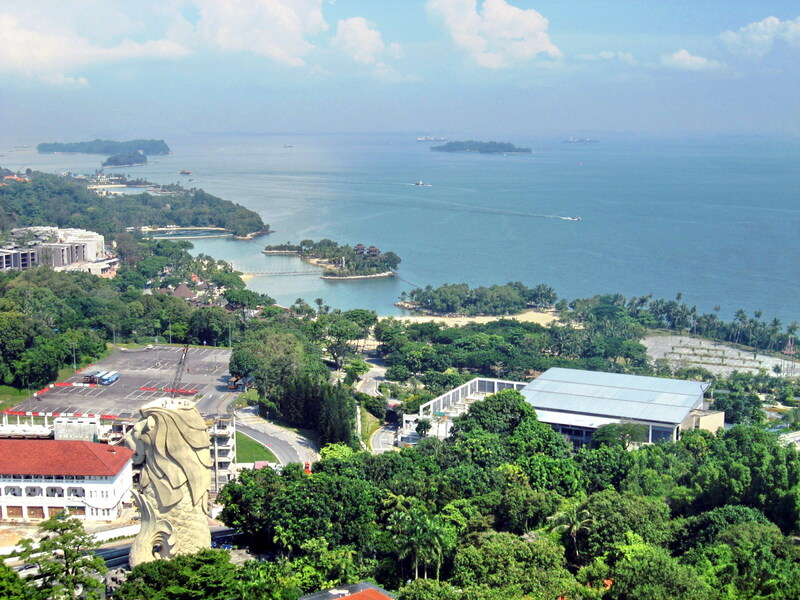 (28 miles) out, are the Indonesian islands of Batam and Bintan, as well as Johor (Malaysia). The Flyer also afforded a great view of the Marina Bay Street Circuit of the Singapore Grand Prix (the first Formula One races were held last September 2008) as it is located beside the straight, between turns 21 and 22, and near the pit area. 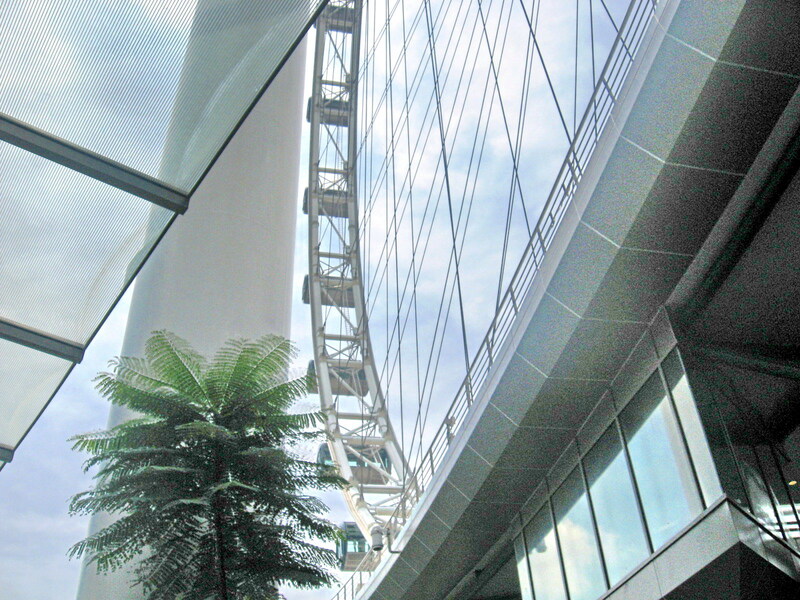 Singapore Flyer: 30 Raffles Ave., Singapore 039803. Tel: (+65) 6333 3311 and (+65) 6734 8829 (Corporate Office). Fax: (+65) 6339 9167. 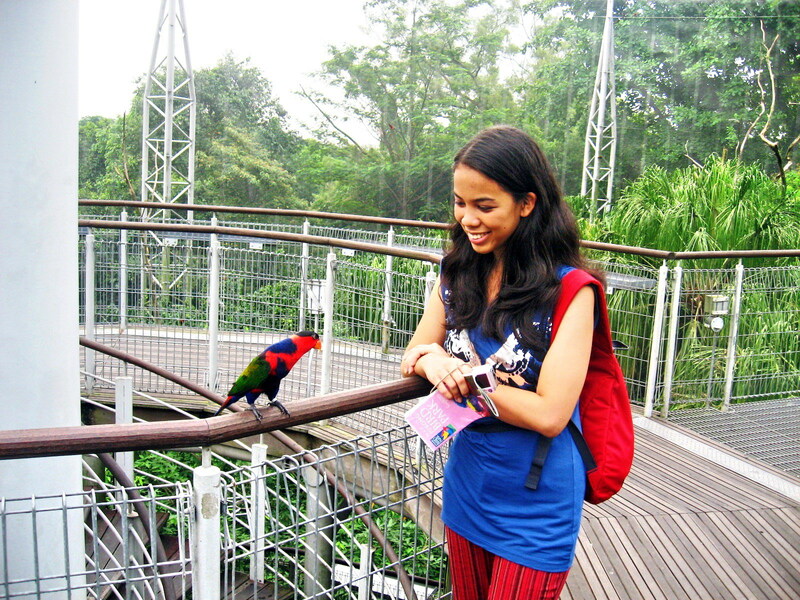 Website: www.singaporeflyer.com. Open daily, 8:30 AM-10:30 PM. 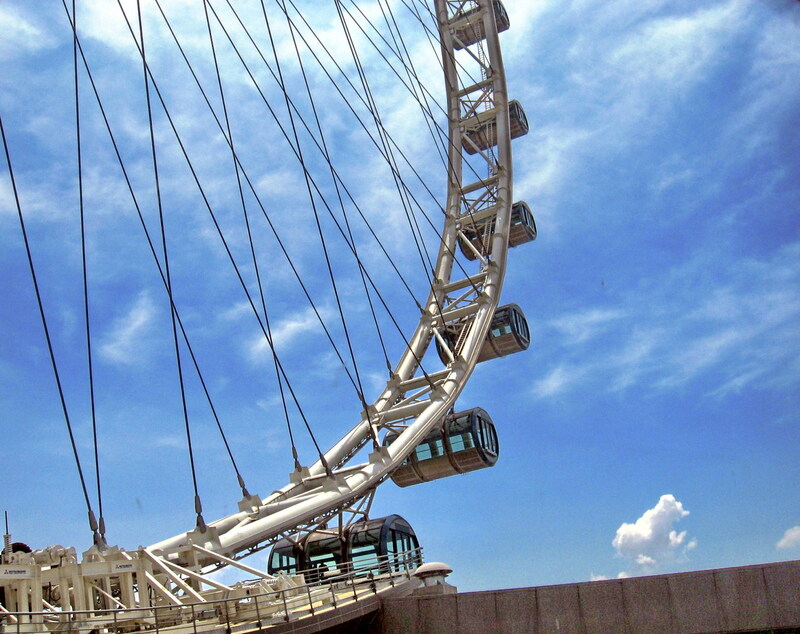 Visitors can take a free shuttle bus from City Hall MRT Station, which operates every half-hour to and from the Singapore Flyer.